This is the S Page of our A to Z guide to plants -- how to care for them, landscaping with them, and cooking and healing with them. This is a delightful informal looking bush covered with soft yellow blossoms. It will grow to be from between five and ten feet tall when mature. 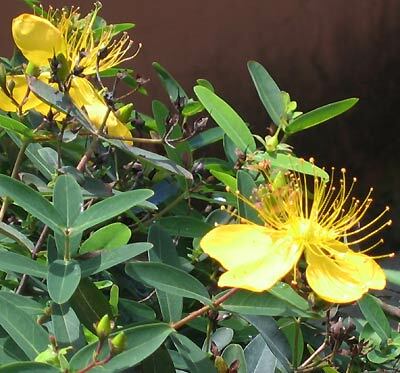 Planting and Care: St. Johns Wort is not particular about light -- it will do well in full sun or full shade, but it does like a routine amount of water, either rainfall or watering. 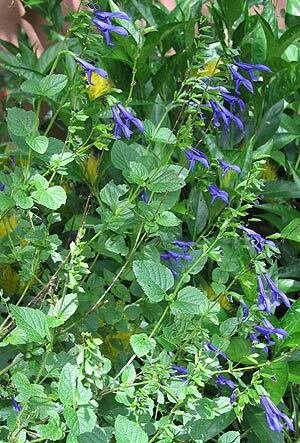 This pretty salvia will grow to be about five feet tall under the right conditions appearing like a shrub. Benefits: Hummingbirds and butterflies find this plant as appealing as I do. Photographed: On the left in the Royal Botanic Garden in Sydney, Australia, in 2013. On the right In the Botanical Garden at the Hotel Atitlan on Lake Atitlan in Guatemala in 2010. 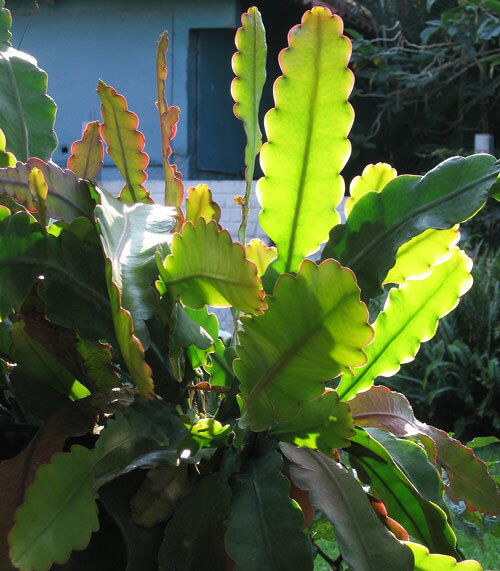 Planting and Care: Give this flexible plant full sun or semi shade and ample or infrequent watering and it will do just fine. This isn't a plant I would probably have if I had a small garden, but then I'm not a great fan of salvias. 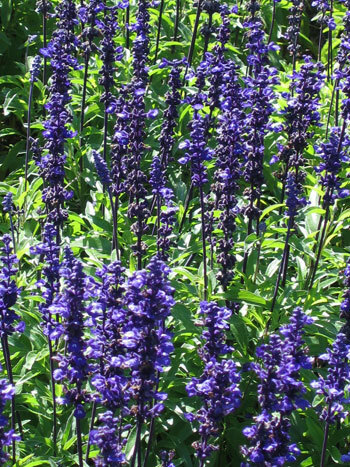 If I had large flower beds this would be the perfect long blooming blue/purple flower to set off many other more spectacular flowers in other colors. 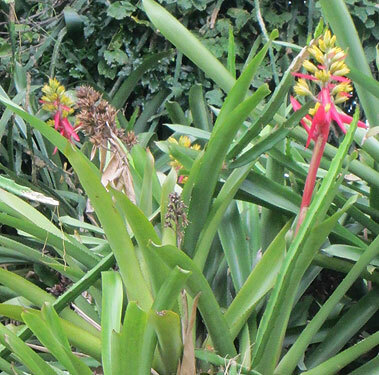 Photographed: On the left in the Botanical Garden at the Hotel Atitlan. On the right in the Blithewold Garden in Bristol, Rhode Island 2013. 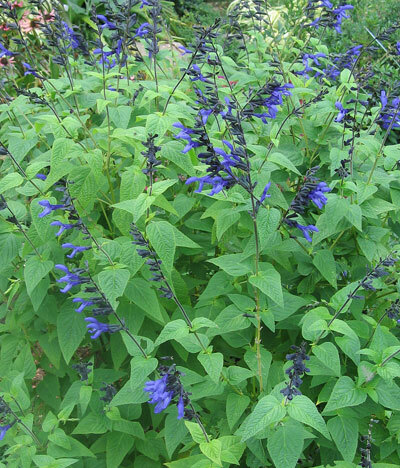 This bright blue three to four foot tall perennial flowering plant will give you blossoms from July through November. Benefits: Bees like this plant as do butterflies. 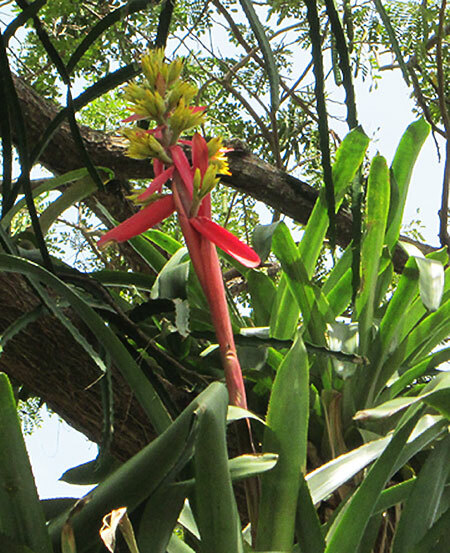 Photographed: On the left in the Botanical Garden at the Hotel Atitlan on Lake Atitlan in Guatemala in 2010. On the right in the Botanic Garden in Wellington, New Zealand, 2013. Planting and Care: In a more northerly climate this plant is ideal for full sun and it is tolerant of a wide range of soils. In hotter climates I would recommend morning sun only. Give it a moderate amount of watering and it will pay you back in plenty! 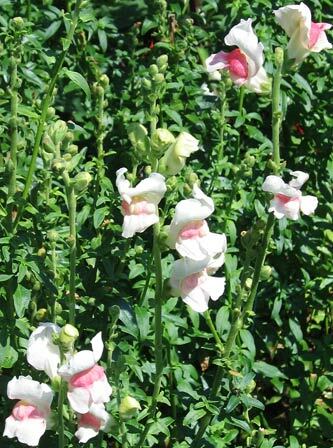 This is an attractive long blooming plant that works very well in a border planting. It will grow to be about 2 feet tall and might best be planted against a wall or to drape over a wall. 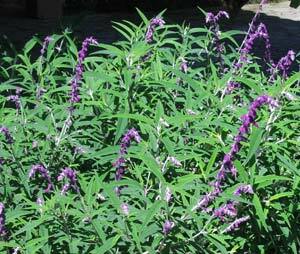 Planting and Care: Happily Mexican sage grows well in full sun and withstands drought well after it is settled in. This is a striking vine like plant that grows relatively low to the ground. Its flowers are small but very special as you can see in the photograph. 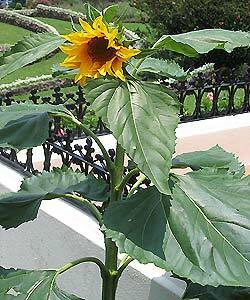 Planting and Care: This plant likes full sun and to appear at its best, it also requires routine rainfall or watering. It will not look great, but it will tolerate dry spells once it has settled in. In the photograph you'll see how bright and intense these pink flowers are. 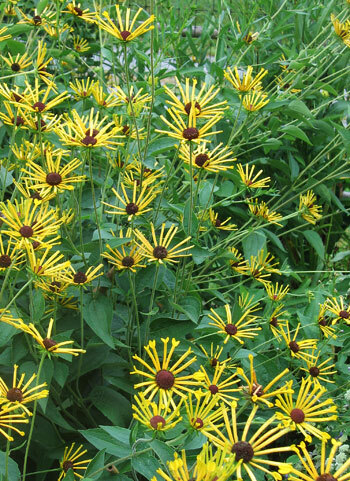 Wonderful, blended with other flowers and used as a background planting as it will ideally grow to be more than 5 feet tall and almost as wide. Photographed: In Thuya Garden on Mt. Desert Island in Maine, in 2013. Planting and Care: In northern climates this is a summer plant that will not survive winter. It those gardens it will do fine in full sun. In warm climates, it is a perennial that will appreciate morning or late afternoon sun with protection from mid day strong sun. 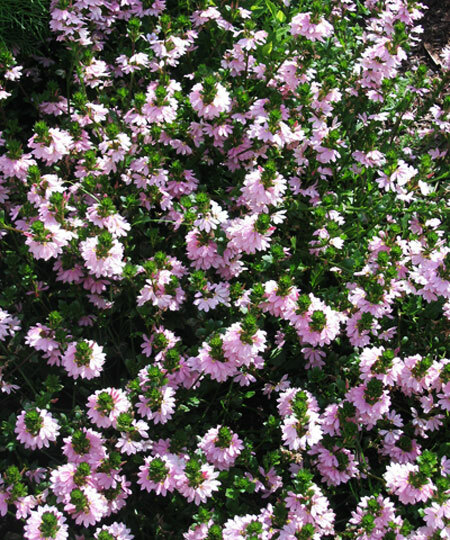 It likes good rich soil and routine rainfall or watering. Mystery solved by Quentin S. in Kent, England. As a member of the mint family, sage is in very good company although I have to admit, despite my affection for this plant, cooked in almost any food it always gives me enormous indigestion. I recall my father had the affliction so maybe it is just a family affair. 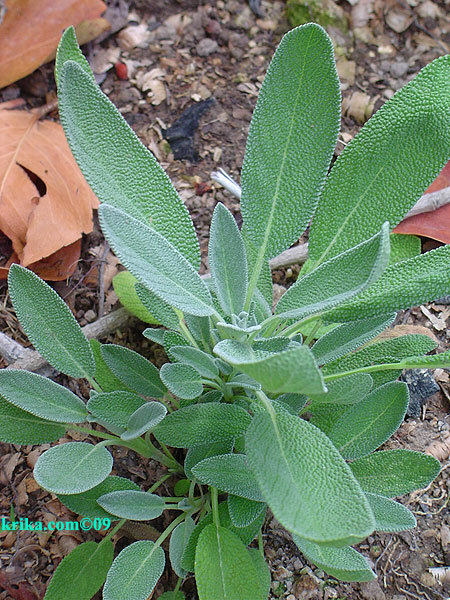 Nonetheless, I adore the flavor of sage as do most of us. Benefits: The Chinese have long held the belief that sage is a very beneficial herb for the aged, keeping their minds active and functioning well. It is also believed by some to be a digestive aid, but you couldn't prove that by me. Photographed: To the right in our herb garden at our former home in Montserrat, 2009. Both photographs below were taken in our garden at Lake Atitlan in Guatemala, 2014. 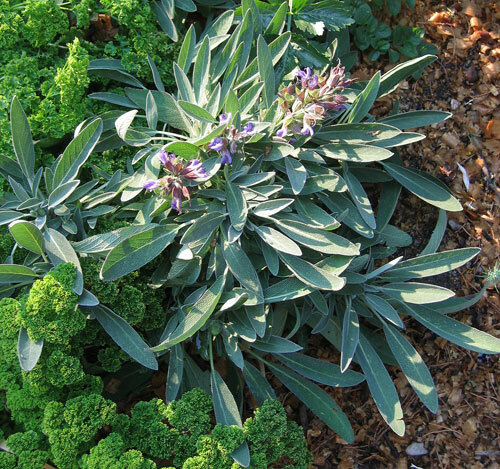 Planting and Growth: Sage likes full sun and water on a regular basis, but in tropical or sub-tropical areas the sun is strong enough that sage will do fine in a semi-shady place in the garden. 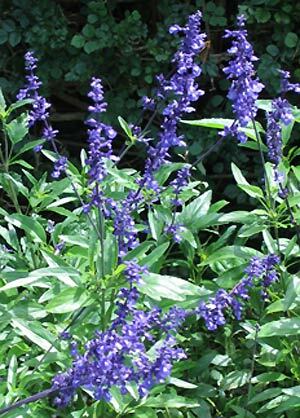 A perennial, sage will grow to be at most about 2 feet tall and will spread sideways about the same. Bees are also said to love sage. Text and Photograph ©Krika.com 2008/2009 and ©GreenGardeningCookingCuring.com 2012. This is another of those increasingly popular old standby plants that serve well adding color in a part of the garden that is too green or that needs an accent. I think it looked particularly nice here with the touch of purple on the other plant. 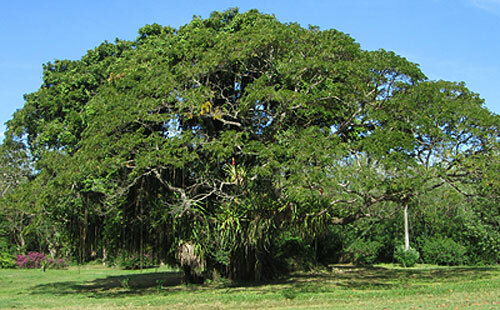 As you will see in the photographs, the saman tree has almost horizontal branches. It reaches a height of about 80 feet and more than double that in width providing a large shaded shaded area beneath its branches. It truly is a majestic tree. 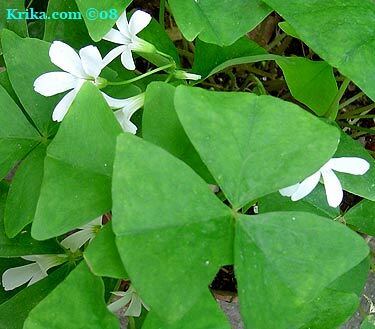 Oddly enough its leaves fold during rainfall and in early evening as well giving it a few of its common names. 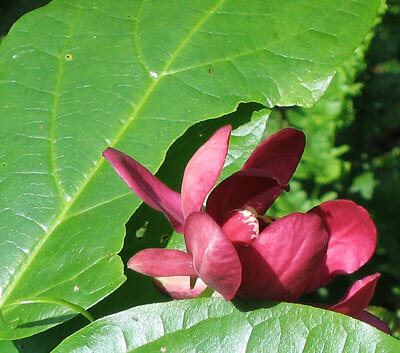 Benefits: It is valued for the wood it supplies as well as being used in traditional medicine for healing properties. 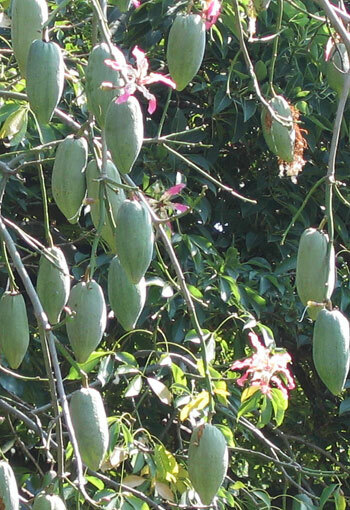 Saman seed pods are edible, usually by children for their sweet liquorice tasting pulp. The saman was perhaps best known for the shade it provided to other plants from tea to vanilla on tropical plantations. From: Tropical Mexico and south to tropical Brazil and Peru. Planting and Care: If you are thinking of planting one of these glorious trees, be sure you have enough property to afford its huge size. Once you have the space for one of these beauties and a tropical environment rest assure you will have success in growing one. They are tolerant of wet and dry conditions along with begin comfortable in a wide range of soil types and pH readings. If you are serious about planting a saman, it is best to consult your local college, university or agriculture department on planting advice specific to your area. 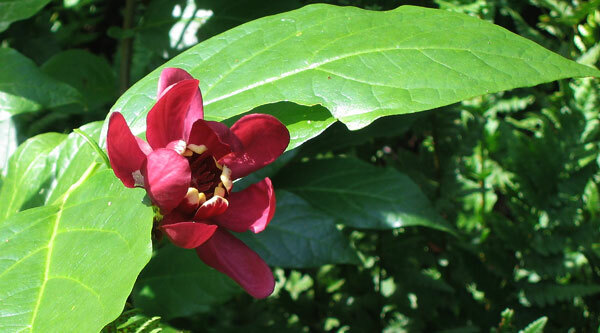 Planting and Care: This fruit tree grows best in full sun, but will do almost as well in a semi shady garden area. It likes routine rainfall or watering as do so many tropical trees and plants. If planted from seed it will take almost ten years to bare fruit. These are the green bruised looking fruits in the photograph on the left. I have never seen them look particularly attractive though they are said to taste like chocolate which wouldn't be so bad. 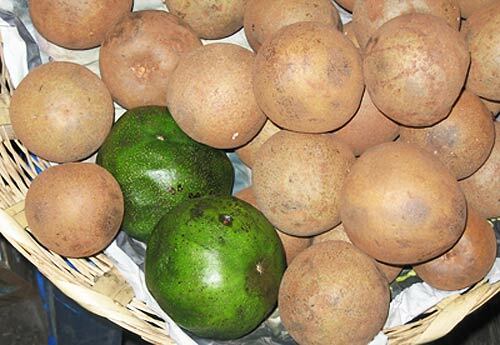 I think I am confusing the sapodilla and the sapote which may not be the same tree or even in the same family. I think the source of my confusion is a lovely lady fruit vendor in a Oaxaca market. She had sapote blancos (white sapotes) and sapote negros (black sapotes) to sell and lots to say about the trees that produce these fruits. Please help if you can. Photographed: In the Sanchez Pascua Market in Oaxaca, Mexico, in 2010. Once you get this vine started and that effort will be remembered, it will grow and bloom and make your life better for years. 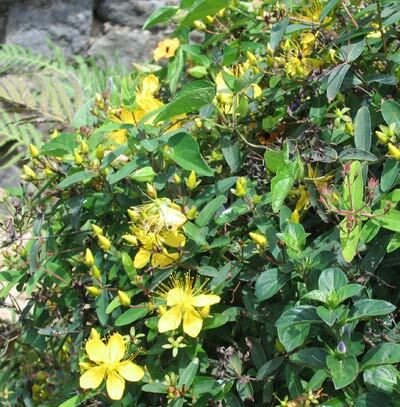 Benefits: The flowers of this lovely vine are attractants for butterflies and hummingbirds. Blooms: From early spring to mid autumn. 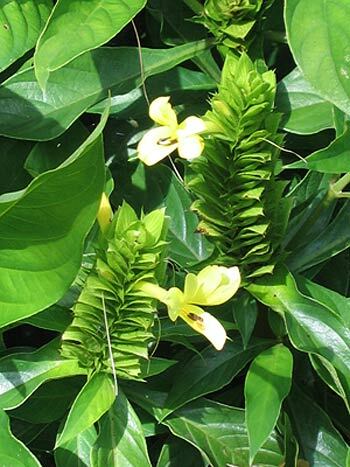 Planting and Care: The saritaea likes a bit of shade and regular rainfall or watering. Like most vines, once it takes a hold of something it can grow on, it does so with gusto. This is an eye catching perennial that will grow to be no more than a foot or so tall. 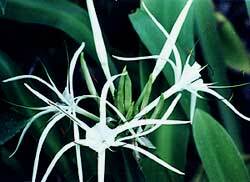 It has wonderful flowers and will spread easily covering the ground under taller plants. 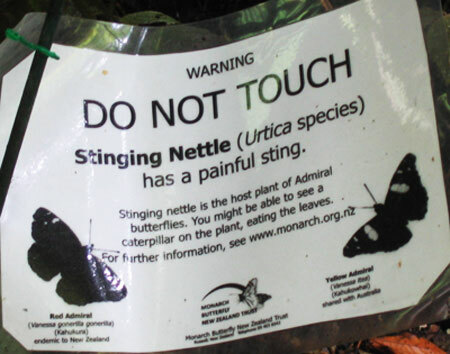 Photographed: To the right in the Thuya Garden, Mt. Desert Island, Maine, 2013. Below on the left in the Thuya Garden, Mt. Desert Island, Maine, 2013 and on the right in the Coastal Maine Botanical Gardens, Boothbay, Maine, 2013. Planting and Care: Give it a place in full sun and only modest water and it will be quite happy. It will not over winter in places where the temperature falls below 32° F.
Benefits: This is a very easy to grow butterfly attractant. 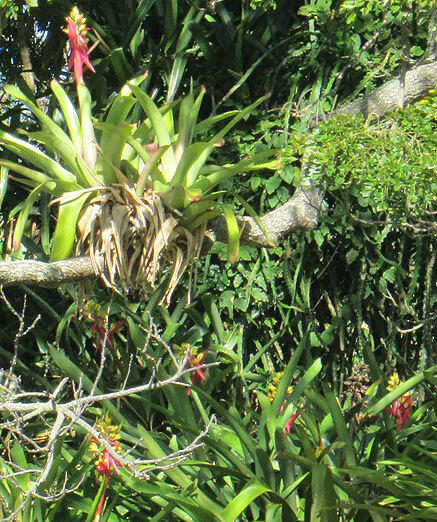 Photographed: Below on the left in the Botanical Garden at the Hotel Atitlan on Lake Atitlan in Guatemala in 2012 and on the right in the Royal Botanic Garden in Sydney, Australia, in 2013. 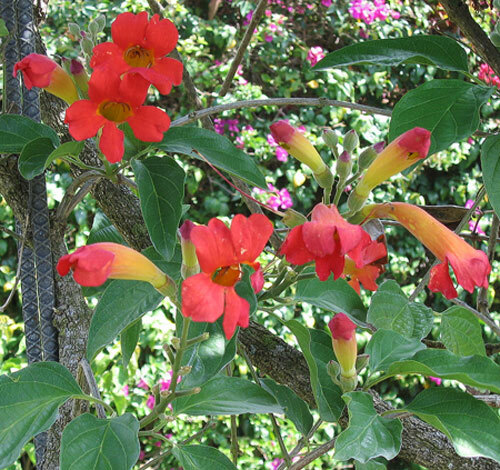 Planting and Care: Grow this flowering vine in a warm climate in full sun. Plant it in good loamy soil and provide it with some type of support. Make sure it has routine rainfall or watering to prevent it from drying out too much. It is a fast and furious vine reaching a length of 40 to 50 feet. Be ready to prune this vine to keep it in order. 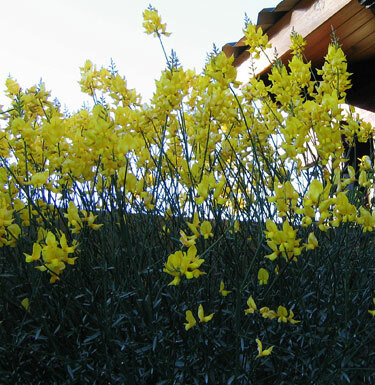 This is a tall wonderful yellow flowering bush aptly named as a "broom" whether Scotch or Spanish. It might as easily be called a "Greek broom" as it covers many of the dry hillsides on the Greek Islands, blooming in profusion in the late spring month of May. It is especially spectacular on the island of Naxos. 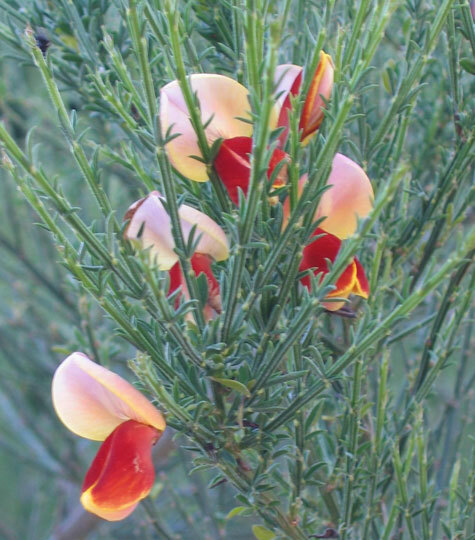 I like Scotch Broom enough to have given a large plant to a friend on her 40th birthday which we all celebrated in black tie and gowns at her "bawdy fawty" party in Rhode Island, the smallest state in the United States known for its strange English accent. Photographed: In Rio Gallegos on the way to Califate in Patagonia, Argentina, in 2010. Planting and Growth: Obviously a plant named Scotch and Spanish and seen everywhere in Greece can be considered tough. 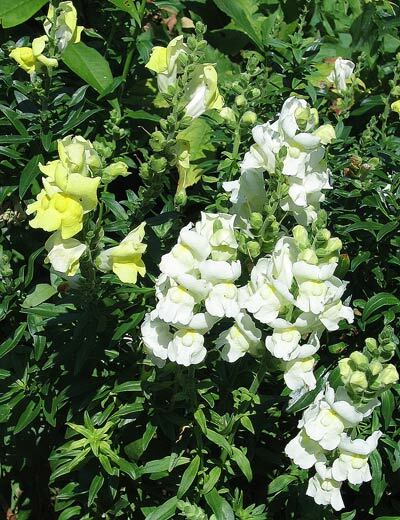 It is a perennial which will grow just fine in dry rocky soil in full sun, although a less harsh environment doesn't seem to do it any harm. Its needs it keeps to itself as most of us should. 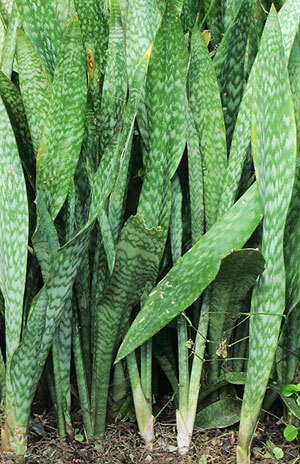 This extravagant if somewhat messy plant really does typify the difference between what you may have in your summer only garden and the endless possibilities you'll find in a tropical garden. What you see in the photograph is a recently trimmed version of the real thing. It is often exciting to visit a garden in successive years, especially a newer one like that in Rhode Island. This plant fascinated me on our first visit and was even more intriguing on our second visit a year later. Its color had deepened, its vigor increased and my photographs seemed to do it more justice. In its native environment it will grow to be a real tree, somewhere in the neighborhood of 50' tall. Benefits: The large screwpine fruit is edible and many parts of the plant are used in its native environment both for utilitarian items and medicinally. Photographed: At the Roger Williams Park Botanical Center in Rhode Island in 2013 and 2014. 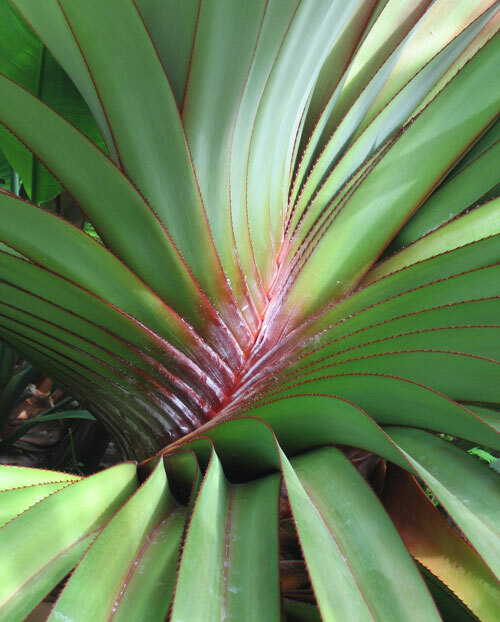 Planting and Care: The screwpine is generally a coast plant perhaps just in from the mangrove. They like full sun, but will tolerate shade. Their soil preference is slightly acidic. Where they really get demanding is water. Count on watering if rainfall is less than 60," but it would be much happier with lots more. 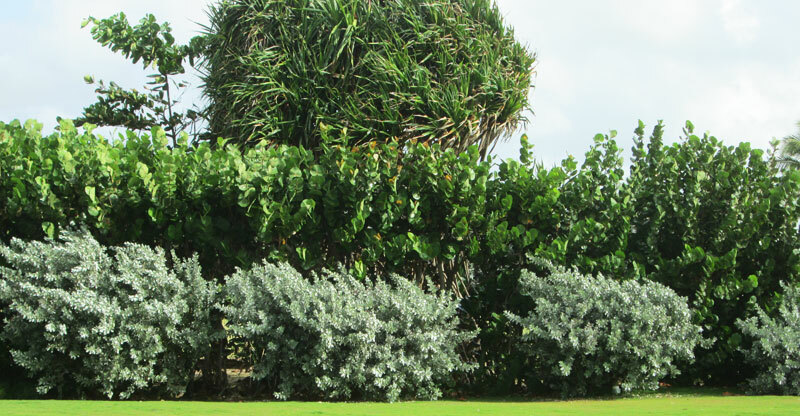 Seagrape is a small tree reaching more than 30 feet in height, but you will most frequently see it used as a trimmed hedge. Benefits: These plants produce a good tasting edible fruit best used for jam or something similar as the fruits contain more seed than anything edible. It is cross pollinated by honey bees so it is an attractant for them as well as us. 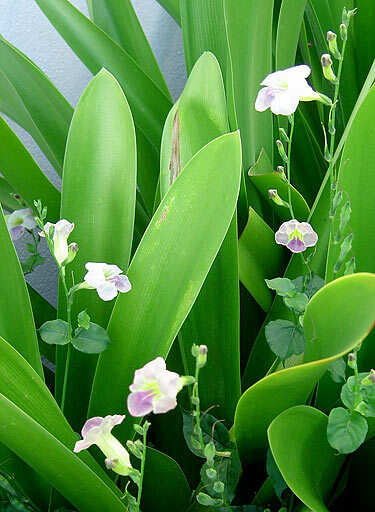 It is known and used as a medicinal plant for a variety of ailments and, surprisingly seagrape is also a good source of iodine. 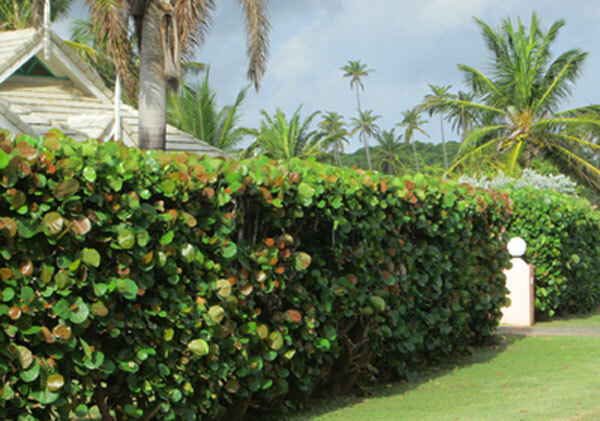 Photographed: At the Magdalena Hotel in Tobago, in 2018. 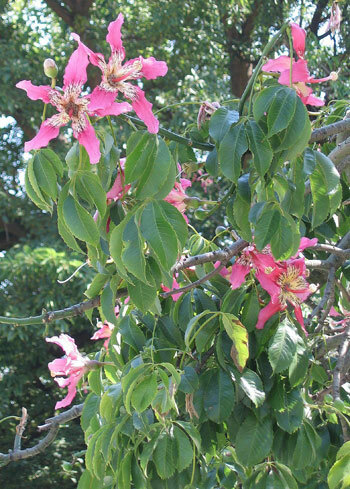 Planting and Care: This is a common tree in the Caribbean where it grows well in full sun or semi shade with just about no care, though it will thrive in well drained and fertile soil. It is intolerant of cold temperatures and of a sea salt environment and once set in seagrape is also tolerant of drought and strong winds. It is good to be aware that each plant requires cross pollination with another so you must have two or have your garden in an area where seagrape is common. 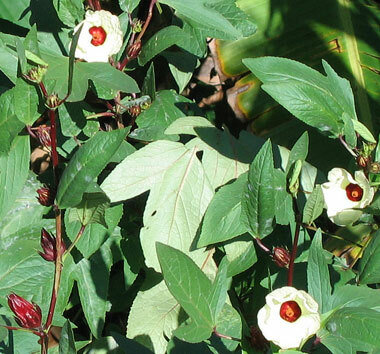 This cotton plant is a perennial normally bearing yellow flowers, but now and then a pink one shows up. 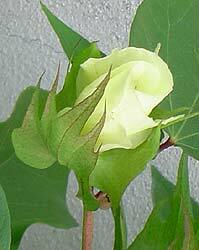 The plant contains gossypol which provides it with insect resistance. Apart from giving us its wonderful cotton, there is an edible oil in its seeds. It grows best in full sun with high humidity and lots of rain. We planted it in between the spider plants in our garden in front of the white wall that provides privacy to our home. Surprisingly, its lovely flowers are even more short lived than day lilies. They last only a couple of hours. The plants themselves are beautiful, even without the flowers. I wrote the note above on sea island cotton just before we left Montserrat for our several month long visit to Taxco. When we returned to the island, the cotton had taken over much of the road. It was, lush and green, about 10 feet high and wide enough to have created a problem for the luckily few cars that pass our house. One funny thing came as a result. We got on the island tour route as tour guides drove island visitors past our former home to see the sea island cotton Montserrat was once famous for. Sadly, I had to trim it back severely and eventually we removed it from the wall garden entirely. We now have it growing on the side end of the property where it has all the space it needs. Photographed: In the exterior wall gardens at our former home in Montserrat. 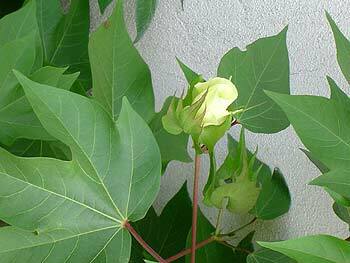 Planting and Care: I'm no expert on cotton, but it is an easy plant to grow. It prefers full sun and routine rainfall or watering to be at its best, but it will do alright with drier conditions once it has settled in. Below is a four inch deep styrofoam tray of basil, parsley and sage seedlings ready for planting outside in our garden. We recycled these styrofoam trays, once filled with grapes from the United States, and their more shallow tops from our small local supermarket. The trays are about eighteen inches by twenty four inches and they make planting a lot easier than many of the more standard alternatives. In Montserrat our biggest problem in planting seeds was getting a good sterile planting medium. I became EXTREMELY creative in making something seeds will like, but it really should be easier. From the Montserrat Department of Agriculture we saw posted roadside signs such as "Eat from the yard, not from the can" and many more touting the "backyard garden." We just have never saw anything that would make a backyard garden or eating from the yard possible without an enormous amount of creativity, tenacity, perseverance and a determination to have "local" food that is not essentially toxic. All of our own gardens are poison free though we have succumbed to using commercial fertilizers. These we use in addition to all the cow manure we can collect and all the compost we can make and incorporate into the worst soil I have ever seen. When soil on a volcanic island such as Montserrat is combined with a tropical climate, gardens require a constant supply of compost or it quickly becomes hard and impervious to rainfall. We also found that planting seeds directly in the gardens was not generally successful, hence I planted everything first in a variety of containers moving them into the garden when they were growing well. Sesame is an annual plant grown most commonly for its seeds. It takes a three or four months for the plant to reach maturity at which point it is from three to six feet tall. Planting and Care: Good soil and lots of sun are the keys to success in growing sesame. 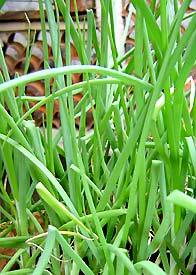 Shallots grow like weeds which makes their high market price (in the US) hard to understand. 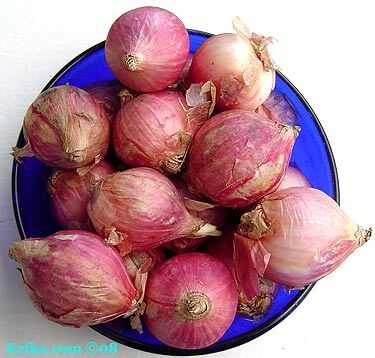 Their flavor is a subtle blend of onion and garlic, not reproduced by combining the other two. At some time shallots became elephant sized like those on the right. I have not seen the smaller variety which I was growing in Mexico for many years. The bigger size would have been fine except somewhere along the line the taste of shallots became less agreeable. Photographed: On the left on our terrace in Taxco, Mexico. On the right at our home in Montserrat. 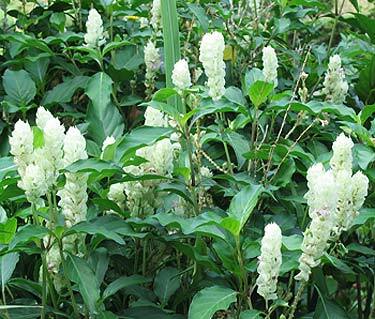 This is a sweet plant with lots of delicate small white flowers. Its leaves resemble shamrocks so it is a perfect St. Patrick's Day gift. It will grow happily in a window of your home in a cold climate, as did my first plants. 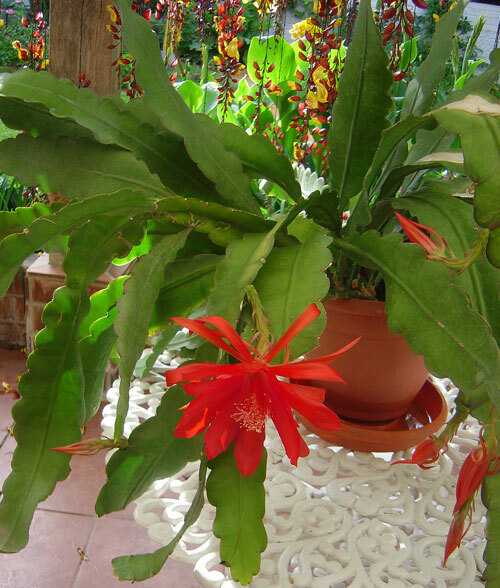 It also grew happily outside in my garden in the Caribbean island of Montserrat. That's not bad for flexibility which automatically makes it one of my favorites. 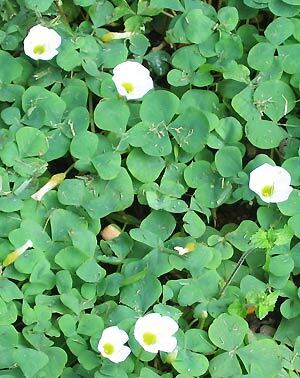 Planting and Care: Oxalis are tiny bulbs which you can plant about one to one and one-half inches deep and about three to four inches apart either in a pot or in the garden. They will do best in semi shade and, like all bulbs, they will need a short dormant period during which they will shrivel back into the ground. During this latter period it is best if you can leave them to their own devices -- no fertilizer and no extra water apart from normal rainfall. I specify the latter because in the Caribbean watering is a regular activity. The high heat and dry windy air take moisture out of plants at an alarming rate. We established our garden beds as ones that will be watered when it doesn't rain for two days and ones that will not be watered except in a serious drought. Bulb plants seem to appreciate our having done so and they live for the most part in the latter garden beds. Shamrock 2, Wood Sorrel Oxalis purpurea or Oxalis sp. 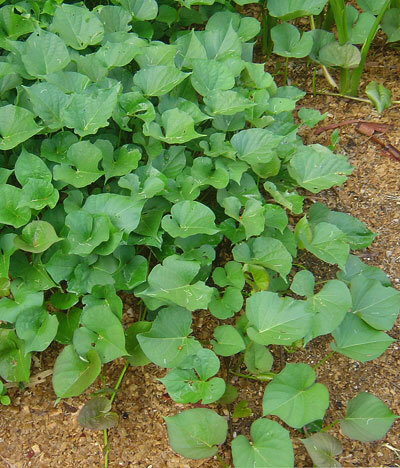 Planting and Care: This is a low growing and sweet plant that makes a good groundcover in areas that are protected from mid-day tropical sun. They thrive in semi shade as long as there is moisture in the soil. They do have a rest period which can be disconcerting as they seem to die and then spring back into life. It's the dying part that I found disconcerting. 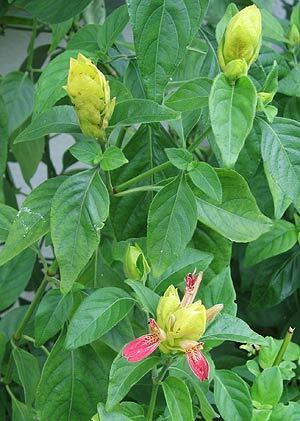 This is one of the stand out shrimp plants, its flowers being a pale greenish yellow color with the addition of touches of rosy red. Planting and Care: It is as easy to care for as it is lovely. Sun and rainfall or watering will keep it happy and blooming for months at a time. Photographed: In the Botanical Garden at the Hotel Atitlan at Lake Atitlan in Guatemala. 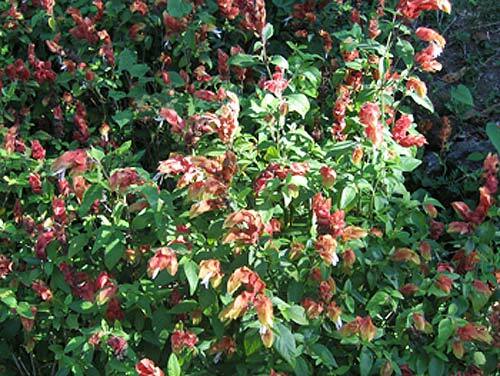 Planting and Care: This variety of shrimp plant will grow well in full sun or full shade, but it does like lots of water. 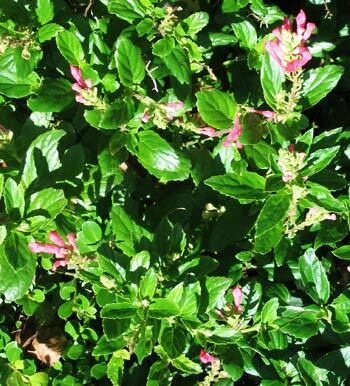 This is a perennial shrub often sold as a potted plant in colder climates. 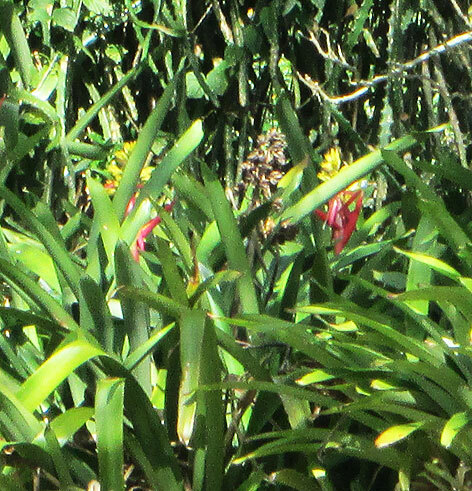 The plants here in the garden in Guatemala have been in bloom for months and seem to have no end in sight. Still, I don't find the yellow variety as attractive as the white flowering plants below. Planting and Care: This is an easy care plant that will do fine in semi shade or full sun with routine rainfall or watering. Don't hesitate to prune it when it gets leggy. 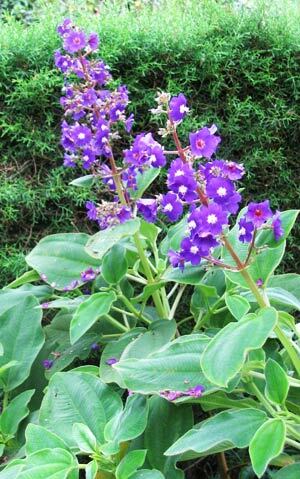 It is a shame that this plant is not frost hardy because of its lovely continuous flowering and its adaptability. If you live somewhere cold, you can enjoy the plant in the summer and either bring it in for the winter or replant each year. Benefits: This is a hummingbird attractant. 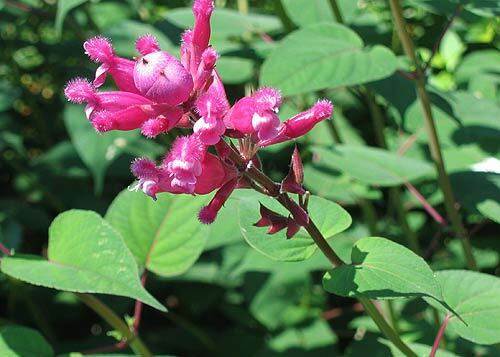 Planting and Care: This variety of shrimp plant seems to do well in almost any light condition and in all of them it flowers prolifically as you can see in the photograph. It is very easy to care for and will reward you everyday with its bright and colorful appearance. Don't hesitate to give it routine pruning. Plants will only grow to about 2 feet tall, but cutting them way back starts fresh foliage and more blossoms. 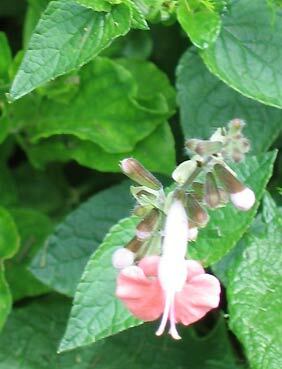 This is one of the less common members of the shrimp plant family, but it is just as showy as the others. Planting and Care: This is pretty much the same as with the others though it does prefer semi shade. Routine watering or rainfall works for the entire family. 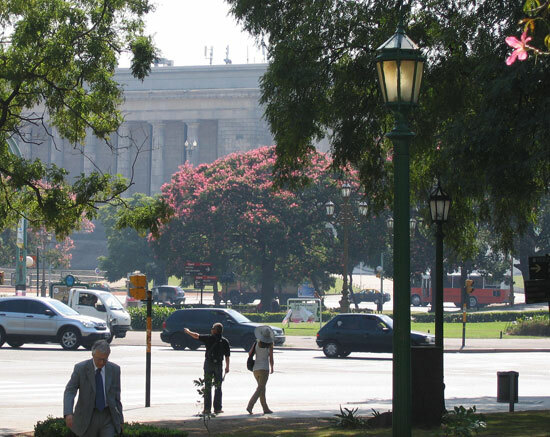 I first saw this unusual tree in Buenos Aires where it is very common. When we were in the city these trees were in full bloom, first having lost their leaves, then fruiting and at all stages they were lovely as you will see in the photographs below. 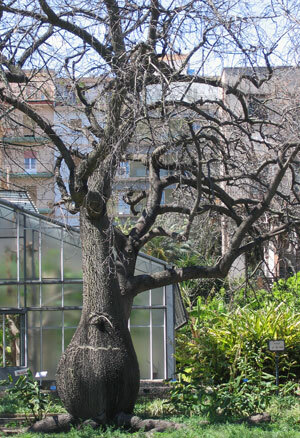 I later very much enjoyed these trees in Palermo, Sicily, in their wonderful botanical garden. Photographed: In the Palermo Botanical Garden in Sicily, Italy, and in Buenos Aires, Argentina. 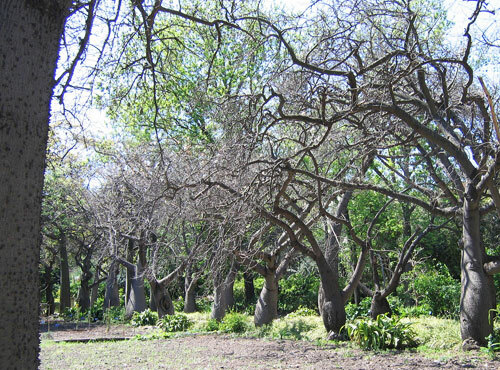 Planting and Care: These trees prefer full sun and routine rainfall or watering. It does not enjoy a real winter, but it does get pretty cold in Buenos Aires which seems to do no harm to these lovely trees. I read that they don't do well planted in grassy park like areas, but you'd have to try hard to prove that to me after seeing so many of them in grassy parks in the city. For those of you just starting gardens, this is a good choice as young trees will grow from three to five feet per year. 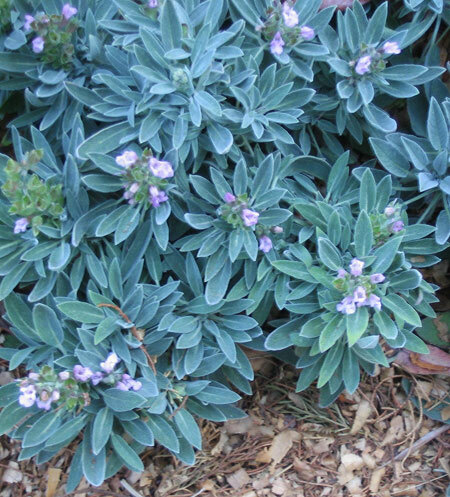 This is a pretty blue/purple flowering plant with perfectly matched gray/green foliage. It will grow to be under 2 feet tall so it makes a good middle sized bedding plant and it will flower through the summer and into fall. 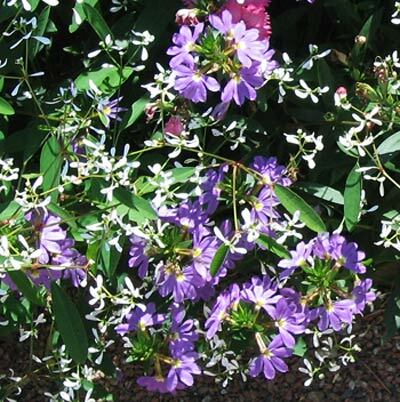 Planting and care: Tibouchina heteromalla is tolerant of being planted in full sun or semi shady areas of the garden and, surprisingly, it is even tolerant of light frosts. It likes well drained and rich soil, but then who doesn't? This is one of my least favorite plants and in truth I tried to get rid of them. On the island of Montserrat, I found it best to wait until late March and into April, our dry season, if you are going to try to make it go away. 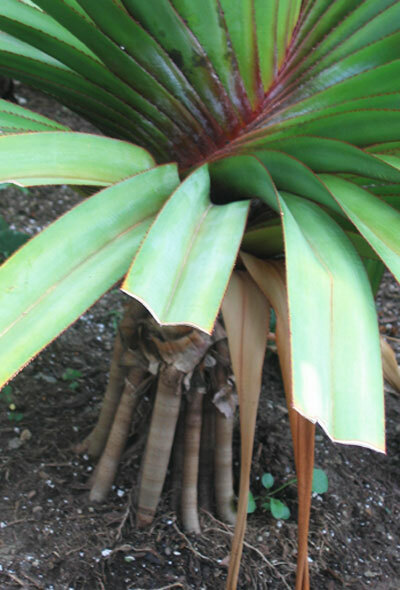 With a sharp machete or cutlass slice the plant off at its base in the soil and spread the leaves on the lawn. The heat and sun prevent it from rooting from the cut leaves and it seems at this time of year the roots do not have enough stamina to grow again. When the leaves are thoroughly dry rake them up and add them to the compost pile. The only alternative is deep digging and eternally eradicating new growth from very hardy tuberous roots. Planting and Care: Since this plant thrives with absolutely no care, this seems silly to write about. These are pretty annuals flowering for a long time in gardens across America. They come in a range of colors and heights and so easily adapt to whatever garden area you'd like to have them in. Photographed: To the right at the Blithewold Mansion, Gardens and Arboretum in Bristol, Rhode Island, in 2014. All others in the Thuya Garden, Mt. Desert Island, Maine, 2013. Planting and Care: Full or partial sun is fine along with routine watering or rainfall. Benefits: Since I absolutely love snow peas I never thought much about their nutritional value. That's a shame really because they are as beneficial as they are delicious and easy to grow. They are high in fiber, vitamins and minerals and may even have a beneficial effect on blood sugar levels. From: The Mediterranean of all places. I bet that surprises you as much as it did me. 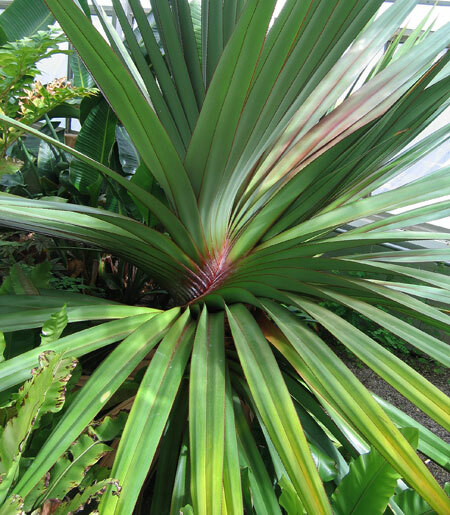 Planting and Care: We got seeds of the variety “Dwarf Gray Sugar” and found they grew quite well in the garden at our former home in Montserrat. 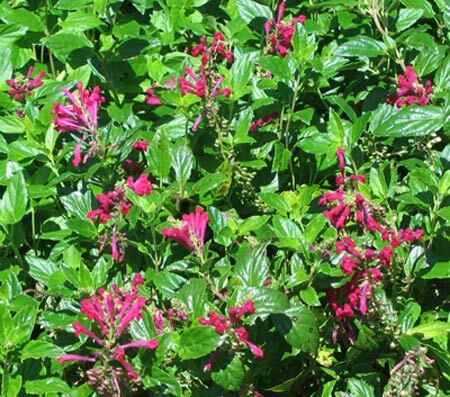 In the Caribbean and in Mexico, plant them in late November or the first week in December to ensure that it doesn’t get too hot for them to yield. When we moved into our home in Montserrat, the soil on our property was as hard as a rock and so deficient in nutrients that the vegetables we planted remained miniatures until we relented and used commercial fertilizer. We also added hundreds of bags of untreated wood sawdust which we used as mulch and also worked into the soil along with the compost we made and the manure we collected. After just a few years we have "real dirt" complete with a few earthworms and our vegetables gardens are showing promise. Consulting with our neighbor, a former member of the Agricultural Department here in Montserrat, we learned that our soil is probably in the pH range of from 4 to 3.5 making it too acidic for successfully growing most annual vegetables. After some investigation, we found a local fellow who would sell us a bag of lime in order to raise the pH, though at an exorbitant price. We were naive and hopeful and had a bag delivered. When it arrived I saw that it was a dark charcoal gray and wondered, "What on earth??" We added it to the soil in our mahogany garden along with compost, waited a week before planting and hoped for the best. After a bit of research on the internet, we learned that what we had been sold at the MSJ Flower Shop & Garden Supplies store in Brades owned by the former Director of the Department of Agriculture here in Montserrat was "burnt lime." We had been told it was appropriate for use in the garden. It isn't really, but since it is no longer available, it is a non-issue. PLEASE NOTE: Produce enhancing agricultural products are terribly expensive in Montserrat -- things such as tools, fertilizer, seeds, seed starting sterile soil and agricultural lime -- if they are even available. But, you can save money when you become a member of the Farmer's Co-op. To moderate the highly acidic nature of the soil here, you will need to use agricultural lime which is not available in Montserrat. You might also use wood ashes, but you will need to burn quite a bit of the forest and save every bit of ash to put in your very small vegetable garden to raise the pH even a little bit. This is apparently what the farmers do as there is almost constant burning in the protected Centre Hills forest area where most farmers have acre or more plots of land on which to work. **Contact the Department of Agriculture for a solution because the highly acidic soil in Montserrat precludes most successful backyard gardening and farming. 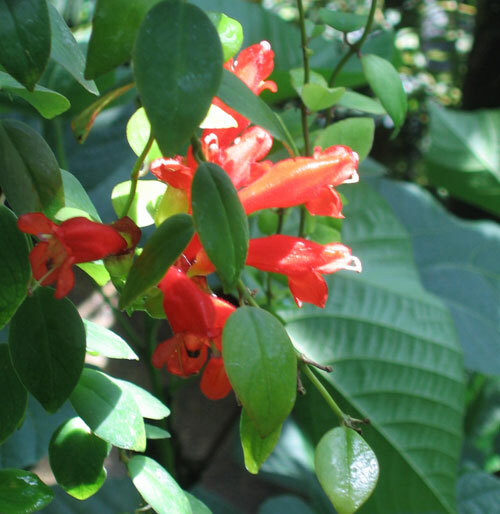 After becoming addicted in Taxco, Mexico, to juice made from the red flowers of this wonderful plant called flor de Jamaica in Spanish, we learned that it isn’t a perennial bush; it’s an annual. 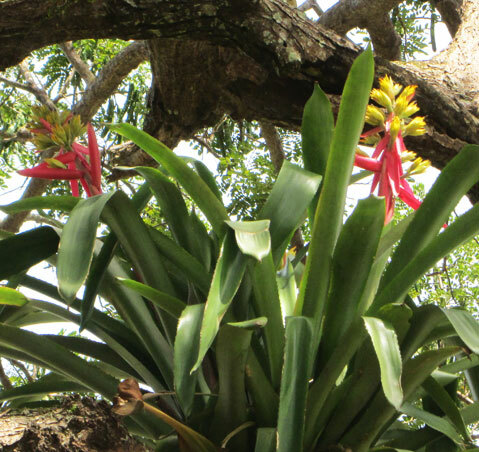 In Montserrat, we plant it in May to have 6 foot plants covered in blooms ready for Christmas. We remove the deep red fleshy covering of the nut and use it fresh while it lasts; the rest we dry and use for as long as they last. Benefits: Dried, washed, and boiled in a tea it is used to treat urinary infections much like cranberry juice. It is loaded with vitamin C, so be careful of a vitamin C overload if you drink more than one very large glass of it a day. Sorrel also is a good source of iron, vitamin A, and calcium. Planting and care: To get started ask some of your neighbors with sorrel plants to give you some seeds. Once they are in the ground you are off and running and will be able to enjoy the benefits of drinking sorrel juice for many years. 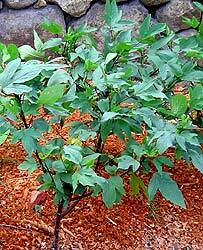 My best advice is to keep your sorrel planting away from any large planting of hibiscus. Give the plants sun, fertilizer and regular rainfall or watering and you'll have a bumper crop. Problems & Pests: As you can see from the latin name, sorrel is in the hibiscus family and subject to all of the same problems and diseases. In the Caribbean, the pink mealy bug has been devastating to many of the once beautiful hibiscus hedges. The mealy bugs easily spread to and enjoy ruining the sorrel as well. If you have a reasonably small crop, q-tips dipped in alcohol do a nice job of ridding your plants of mealy bugs. For more aggressive, less fastidious gardeners simply use your fingers to squish the mealy bugs. ALERT: Much of the sorrel flower product sold has already been washed to retrieve the color and vitamin value of the flowers. With a bath of purple #4 or 5, the sorrel can be sold again with none the wiser, but you! Put about two cups of loosely packed dried flowers, 1 quart of water and two cups of sugar on to boil in a good quality stainless steel pan. Keep it covered at a low boil for about 20 minutes. Pour it through a fine sieve, cool and store the sorrel syrup in the fridge. To make juice, fill glasses about 1/4 full of the syrup, add ice if you like and water to cover. Note: In the lower left hand of the photograph on the left you'll see the fresh fruit used in drying. To use it fresh, pick about two quarts of the red "berries." Assuming they grew in an organic garden, give them a good rinse to get off any dust and dirt. Put them in a pan as if using dried sorrel and use the recipe above. **Soursop Tree, Cherimoya, Chirimoya, Custard Apple Annona muricata L.
This is a relatively small tree growing at most to only about twenty five feet tall. We have two that live on the hill beside our pool and one that lives just by our banana garden. 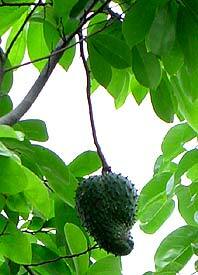 They give us the bumpy, soft, spiny-skinned soursop fruit each one of which weighs between two and five pounds. 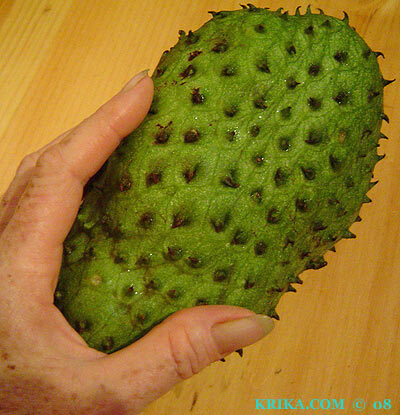 When ripe and cut in half, soursop is creamy white with a slightly sour taste and lots of seeds. Maybe the best thing about this tree is that it is just about free of diseases and insects, though in appearance it is a bit scrawny. 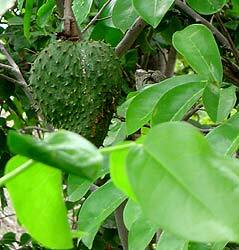 Benefits: Aside from giving us one of the premier fruits of the world (for true fruit lovers), the soursop's leaves are used as general curatives in teas and baths. 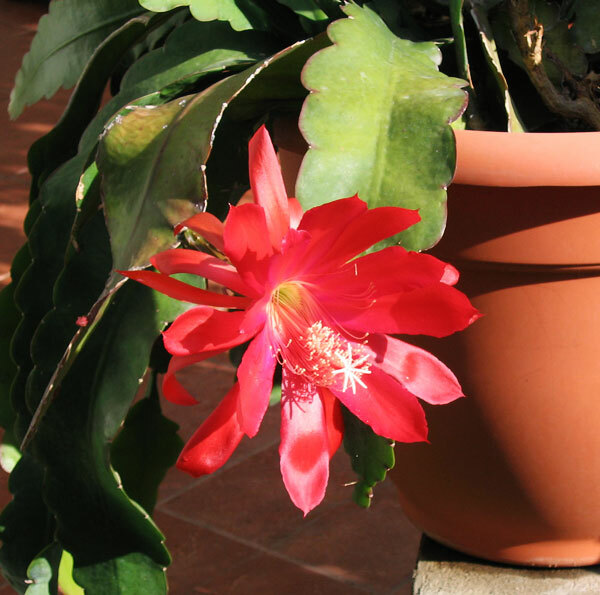 Photographed: In my hand and below our terrace garden at our former home in Montserrat. This was the first gift plant I received in my life. My Godfather knowing my love of gardens and plants gave me one for my sixteenth birthday. It was the best gift I could have received on that special day. Benefits: Reading Yahoo news regularly netted me this wonderful tidbit on one of my favorite plants. 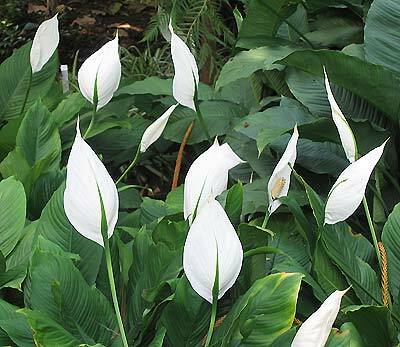 "A pro at removing a laundry list of toxins, including acetone, benzene, alcohols, and ammonia, the peace lily is the only air-cleaning plant on our list that flowers." Photographed: Below on the left in the Royal Botanic Garden in Sydney, Australia, in 2013. Below on the right in the Botanical Garden at the Hotel Atitlan on Lake Atitlan in Guatemala 2010. 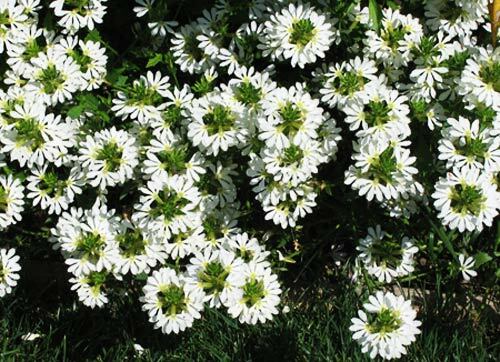 Planting and Growth: These deep green foliage plants with their occasional striking white flowers are a delightful addition to any fertile, shady and well watered and drained area of your garden. As an indoor plant keep the leaves free of dust with a once a week wash with a soft wet facecloth. Keep it near a bright, but not sunny window and water it when the soil feels dry. It is an especially easy plant to care for though it will take very good care of you and the air you breathe. Problems: Insect pests are usually mealy bugs which will succumb to a regular spraying of soapy water or a solution of neem oil. 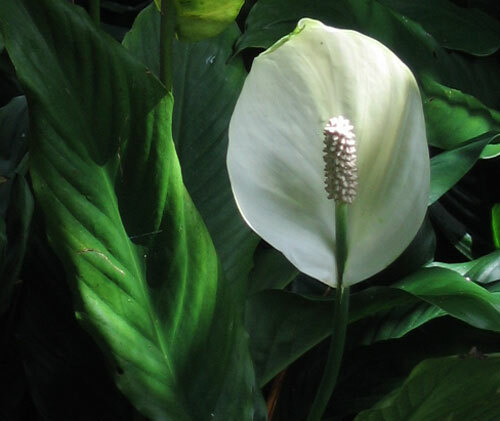 Note: A quote from a great web site called TopTropicals.com reported that "The NASA Study found that Spathiphyllum is one of the top 10 plants to "clean air" and help fight "Sick Building Syndrome". With up to three foot long three inch wide strap shaped leaves and a two and a half foot flower stem, this is one of our favorite plants. On an irregular basis and all year long, it has spectacular spidery white flowers as you can see in the photograph to the left. 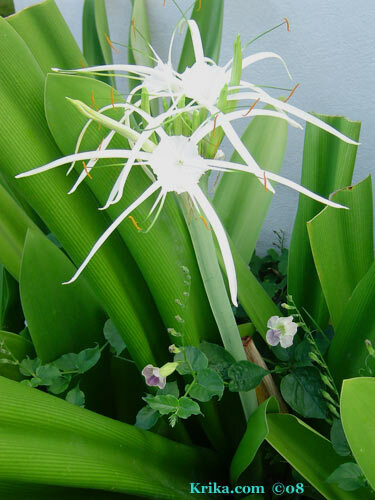 From: The spider lily is a member of the amaryllis family which originated in tropical America. 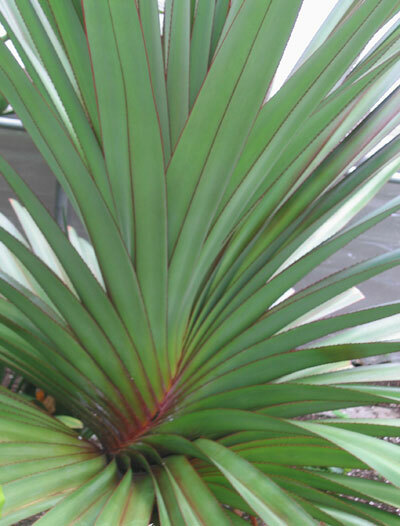 It is a very tough plant and will survive in terrible circumstances, but will be happiest growing in light shade with a medium amount of water. 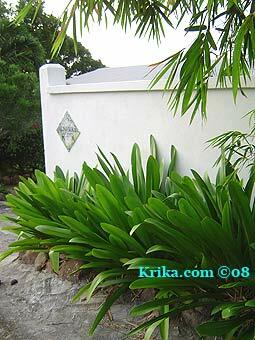 Photographed: In our exterior wall garden at our former home in Montserrat. Planting and care: Plant your spider lily bulbs just under the surface of the soil in a garden bed well-worked with compost. If your soil is heavy in clay, add sand along with the compost and mix it until it begins to look like good soil. If you take good care in preparing the soil beforehand, you will almost never need to intervene in the future. 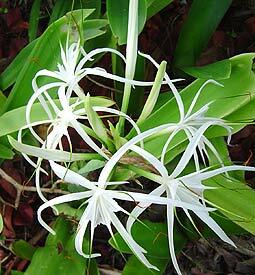 Spider lilies will thrive for years with just a bi-annual dose of fertilizer or a more frequent dose of manure tea. Problems: Normally these lilies are problem free, though each year they do have a couple of weeks of caterpillars. We had hundreds of them for many weeks in 2007 which was the "Year of the Caterpillar" in Montserrat. The caterpillars are relatively easy to control if you cut off the spent flower stems every day and take a daily walk by your plants to see how the leaves are doing. 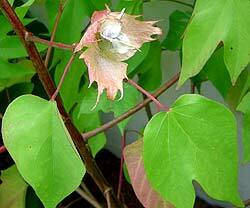 Remove and destroy any leaves showing small caterpillar damage. If you are using the spider lily plant as a foliage plant, during caterpillar time simply cut and remove the flower stems before they bloom. Below are photographs of our spider lilies in Montserrat which were accompanied by a volunteer guest called Asystasia gangetica. Isn't it lovely? **Spider Plant Anthericum or Chlorophytum comosum 'Vittatum' or Chlorophytum sp. This is the old standby hanging plant found in most homes of indoor gardeners living in New England (and probably elsewhere). A sunny window and regular watering often produces more plant than you ever really wanted. 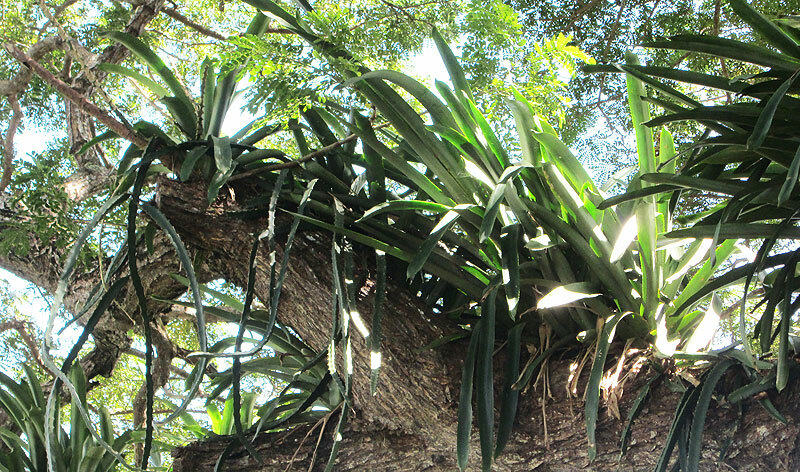 Here in the Caribbean they thrive in the shade or semi shade with very little care. They do like some moisture on a regular basis, but survived our serious drought in the summer of 2007 when we were not here to water. 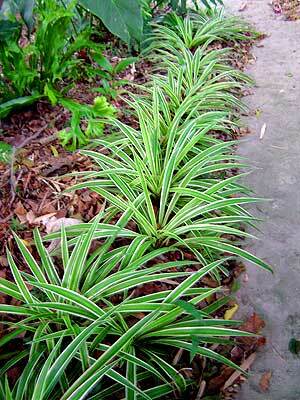 Fertilizing is okay, but be a little more stingy than you are normally; spider plants do not like a very fertile soil. Problems: There is something that chomps some of the leaves, probably an agouti, but the plants have never become unsightly or ill-looking as a consequence. These easy to care for low growing plants make great garden borders in cool climates in semi shady areas of the garden. In hot climates I think full bright shade would be best. Benefits: They may have been used in some way to treat spider bites. 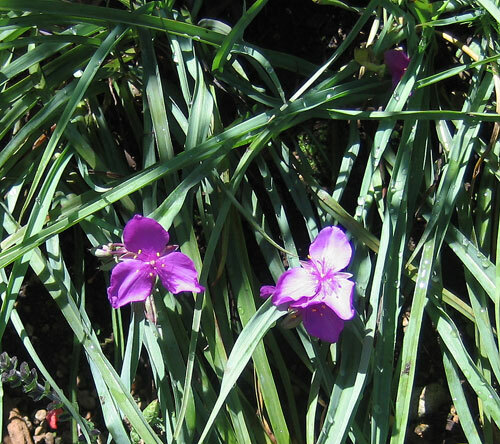 Planting and Care: Spiderworts are tolerant of soil variations, but truly prefer an acid soil. They like some shade and a reasonably moist environment so routine rainfall or watering is key. Planting and Care: This little moss likes it warm, damp and shady, making it a perfect warm climate plant for filling in nooks and crannies in your garden. **Spinach (1), Bhaji Amaranthus dubius Mart. or maybe Amaranthus viridis. 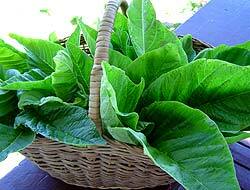 In most of the Caribbean and in Montserrat there is a leafy plant sold locally called spinach. 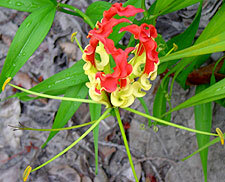 In many parts of the Caribbean it is known as a weed and is called bhaji. 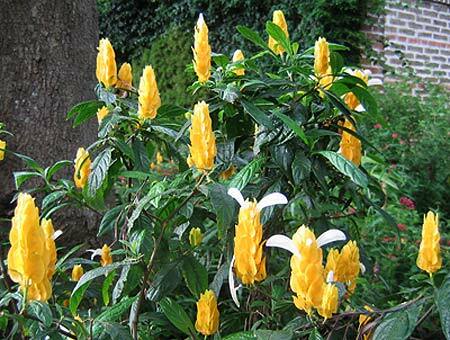 It produces prolifically year round in Montserrat and probably in most of the Caribbean. It does not look like the plant we know in our spring time New England gardens, but surprisingly it tastes very similar. 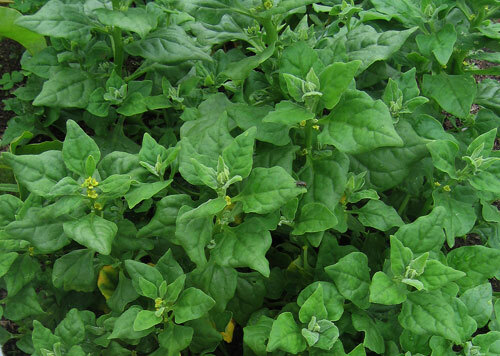 It grows well in the hot climate of the Caribbean which makes it a great alternative to the cold weather northern spinach which almost always bolted in my New England garden before I ever got to eat much of it. Benefits: Along with beets and Swiss chard, spinach is a good source of Vitamin A, calcium, and phosphorous and with broccoli and asparagus, spinach is high in vitamin K which can neutralize anti-coagulants. These vegetables promote blood clotting. Spinach also might be considered a wrinkle-fighter with its antioxidant benefits -- vitamin C and E along with beta-carotene. These latter benefits with help protect your skin from exposure to the now damaging rays of the sun. Spinach is also a wonderful source of magnesium and the alternatives just aren't as appealing. Photographed: In our upper garden and on our deck at our former home in Montserrat. Lightly fry one diced onion in about two tablespoons of oil in a large heavy frying pan. As the onions are becoming translucent, add a thumb sized piece ginger that you have minced and saute the two together until cooked. Next add a 14.5 oz. can of whole tomatoes diced along with the juice and one teaspoon of good quality curry powder. Heat all ingredients together at a medium to low temperature adding about twenty-five grinds of fresh peppercorns. Meanwhile wash the spinach well and slice across the leaves in about one inch pieces. When the onion and tomato mixture is fully cooked, raise the heat and in a few minutes add the spinach and stir in as if making a Chinese stir-fry. When all looks minimally cooked add about one cup of sour cream and heat through. Serve over rice. Cook this spinach and use it in any recipe you have calling for cooked spinach. You will be very pleased with the texture and taste, but I don't think I would try using it in a raw spinach salad. 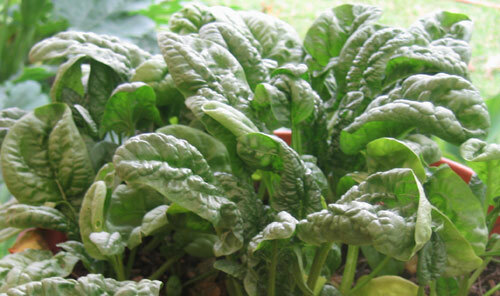 This is another type of spinach commonly found in Caribbean markets. The plant itself is a vine although you will almost always just see mature leaves for sale. It looks almost identical to what we call "spinach" in the States, but doesn't taste the same. From: Australia and of course New Zealand, Japan, and the southern countries of S. America. 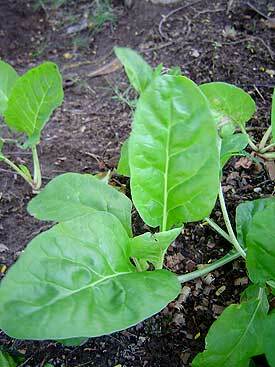 Planting and Care: This is a particularly nice cooking spinach and it grows much more easily than the spinach we most commonly know in salads. 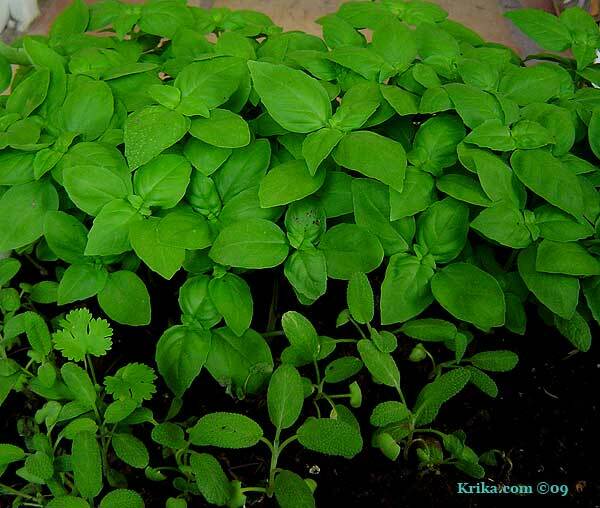 Plant it in successive weeks so you have a continual supply of fresh plants. Give it full sun or a mix of sun and shade if you are in a tropical environment. Water when dry and you will have a bountiful supply of this good tasting spinach. Who is out there that doesn't love a spinach salad, or spinach souffle or a spinach omelet? You'll need a cool climate for this variety. Benefits: What worked for Popeye works just as well for us. Eating just one cup of this spinach gives you more or less half of your daily requirement for magnesium. Remember it probably also gives you way more than your daily dose of pesticides unless you buy it grown organically or grow it yourself. Photographed: In my garden at Lake Atitlan in Guatemala in 2014. Planting and Care: We are using the variety called "Bloomsdale Long Standing" because it is more heat resistant than many others. 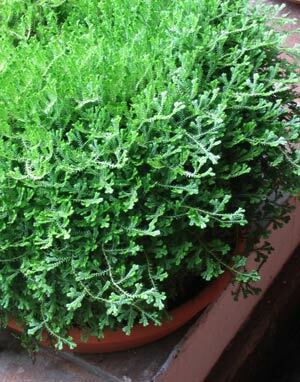 It grows well and quickly planted in pots that can be moved away from mid day sun. This is one of my very favorite foods. 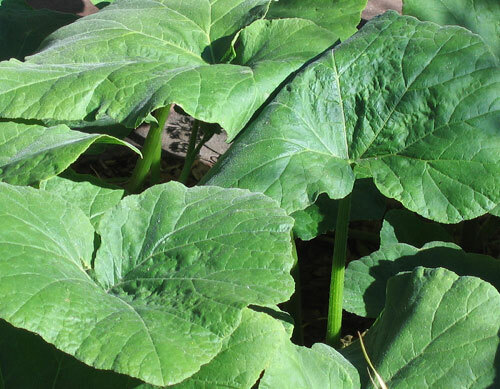 This wonderful vegetable grows well in the Caribbean, or at least it did in Montserrat, holding up to the sun and heat better than we ever expected. In New England I always planted it directly in the the garden. In warmer climates we plant seeds in small pots and then transplant the small plants to the garden; otherwise the yield from seeds is very low. 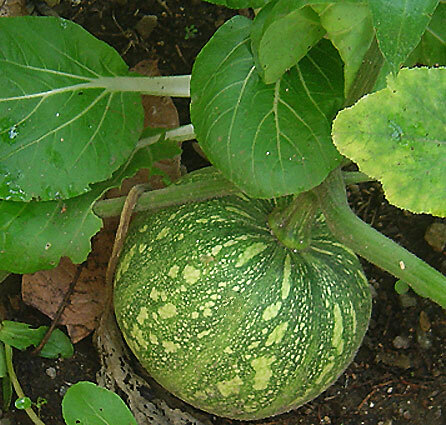 This is a winter squash that will thrill you. Folks from the neighborhood and maybe even the local press will be visiting your garden to see this wonder. When last in Naples I asked a street side vegetable and fruit seller if I might have some seeds to what looked like a beautiful squash. He had cut the beast into pieces to sell so I had no idea what was going to grow in my garden. 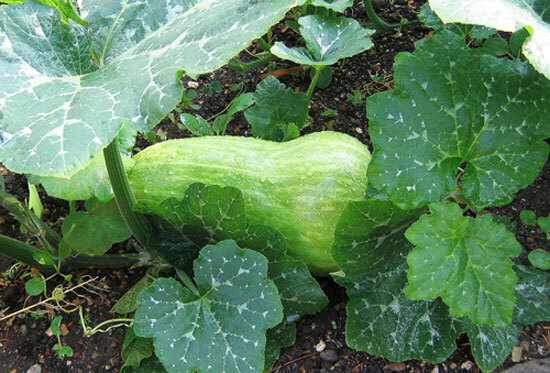 I got the seeds home and in the ground and soon enough a Paul Bunyan squash plant was thriving. 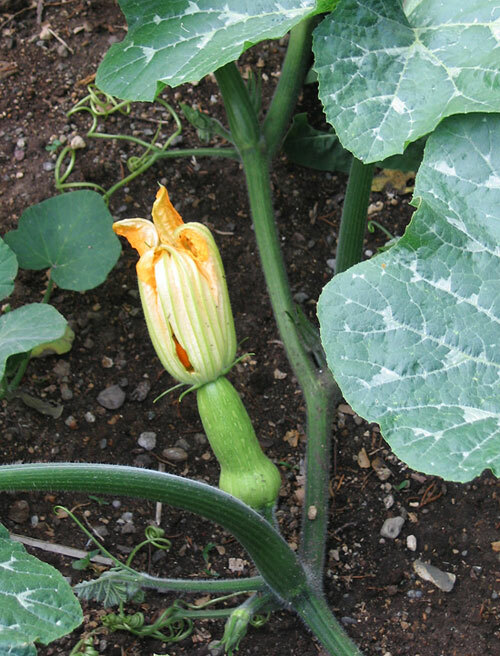 Soon enough we had male and female flowers and with a little help from us not later we had small squash. The plant continued to grow exploring its available space and as it went it made more flowers and we helped. I don't think I'll even be able to lift the first one. 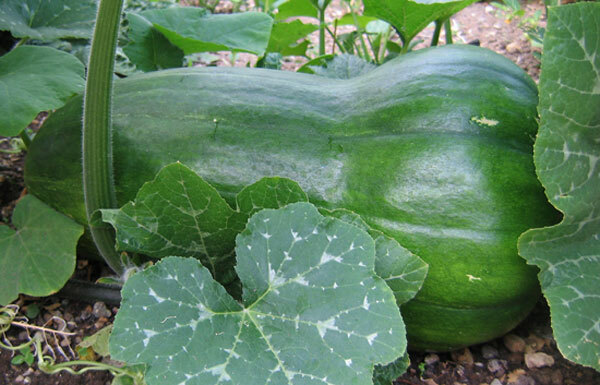 Benefits: The squash is a great source of Vitamin A and fiber. The seeds, which are high in protein, oil and minerals, are believed to kill intestinal worms and parasites. 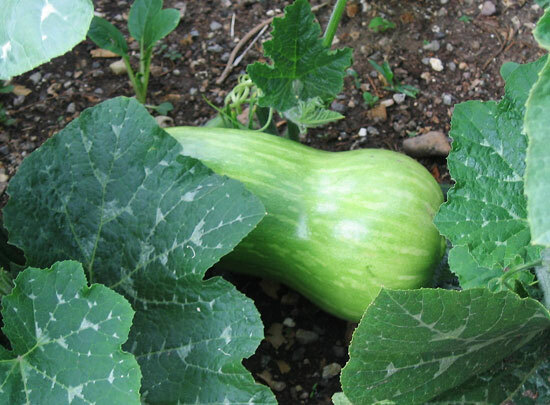 Harvesting: It has been difficult to find information on this squash, even identifying it wasn't so easy. On our first plant we had two really huge squash. One was beginning to change color so we thought we'd harvest it. As it turned out, it was rotten stem to stern. We harvested the other on that day and it was perfect. I would advise if you have these behemoths, get them when they are huge and still green. I read somewhere that in storage they will change color, but no information on where or how to store them or how long they will last in storage. If you have any information, let's share experience because this is a really exciting plant. 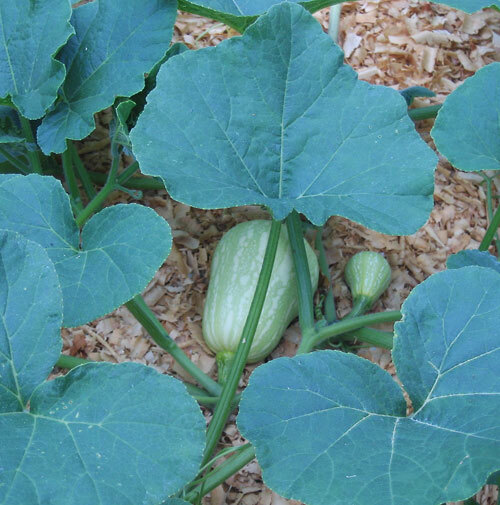 Planting and Care: Plant these squash at least five feet apart and if you aren't growing them commercially think about having at most two plants. As you can guess from its origins, it is well adapted to a warm humid climate. It is also remarkable in its resistance to plant pests and diseases, even the squash vine borer doesn't get an easy ride here. In my experience, plant it in full sun in good soil. Keep it reasonably moist and enjoy the show. 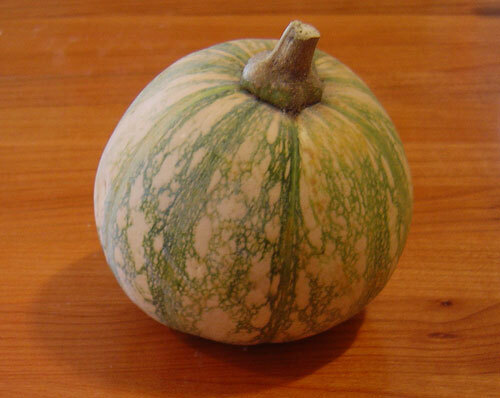 One of the nice things I see in this squash is its size. Though we haven't had one yet, we'll have one meal to enjoy it and then something else from the garden to enjoy. With squashes like the long squash of Naples you have no choice but to have a freezer or lots of friends who want to cook. 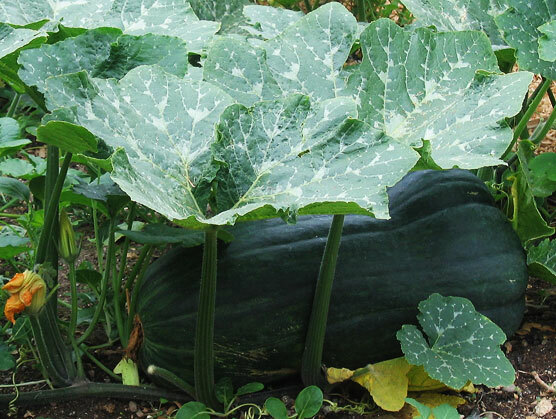 Benefits: It is said to be resistant to a lot of viruses which is essential in a commercially grown squash. From: North America, though I never saw it there. 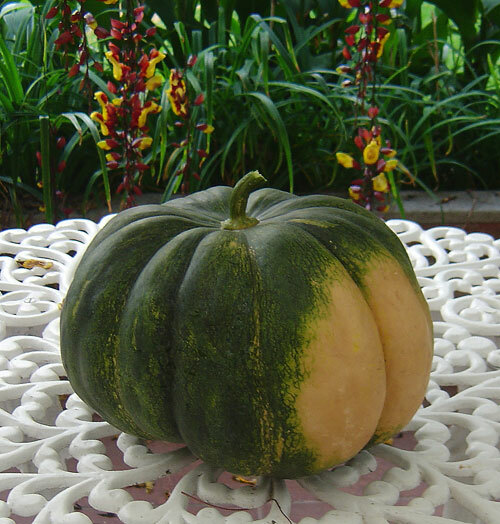 Planting and Care: In truth, I didn't ever plant this squash, but it showed up in a bed with butternuts and long squashes of Naples. 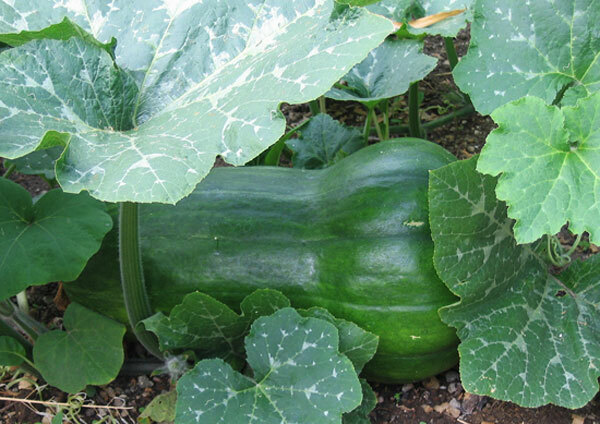 I suspect you plant it the same way you do other squash. I'll report back if it is good enough to go in the garden again. I had seen this beautiful fruit in specialty markets for years. 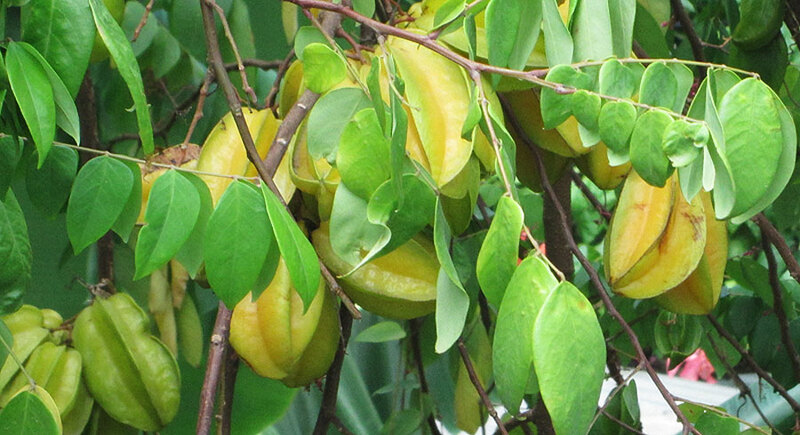 When we passed a star fruit tree while driving I was thrilled and these are the photographs I took at the time. 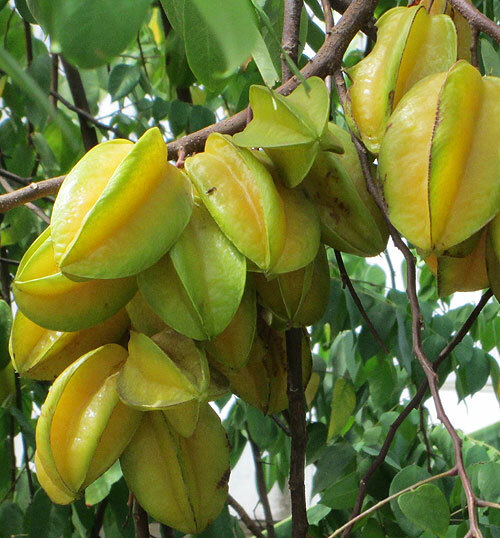 Benefits: Star fruit is a good source of vitamin C. The fruit is entirely edible and often served in small stars as you can see in the photograph below. It has a light and exotic sweet taste. They are healthy for you as well providing anti-oxidants and having anti-microbial characteristics as well. Photographed: Beside the road on the way to the Latour Farm in Golden Grove, Tobago, in 2018. Planting and Care: Growing to an approximate height of 30 feet when mature, this relatively small tree prefers to live in full sun with its feet in fertile well-drained soil. 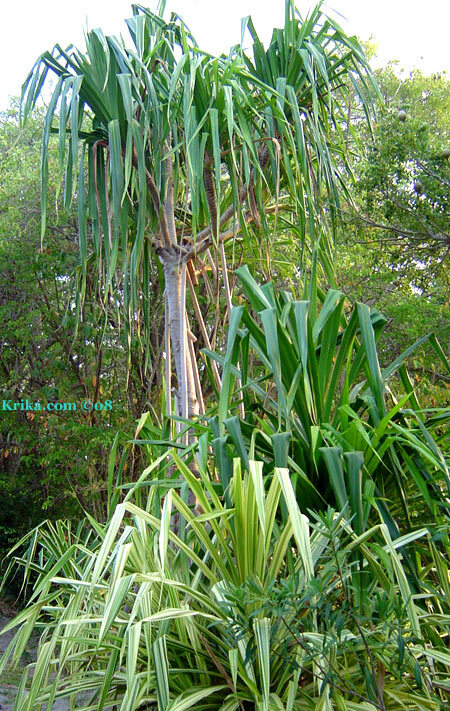 It is a tropical tree requiring relatively high humidity and frequent rainfall or watering. Warning: This fruit should not be consumed by anyone with any type of kidney disease or problem. 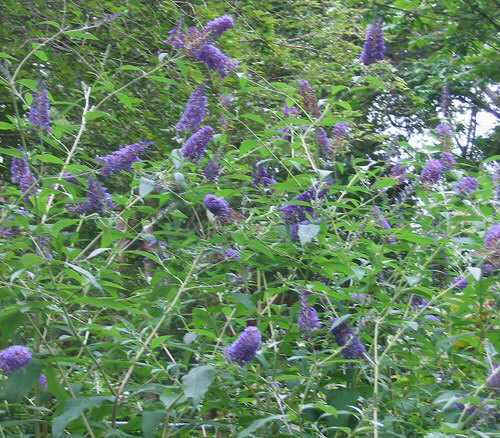 This is an old fashioned plant found in many traditional summer gardens as an annual. Usually it is harvested and dried to beautify homes in the coming winter with its bright colors. In warmer climates it is sold fresh and serves the same purpose. Planting and Care: This is an easy to care for plant that requires very little. Plant it the hot sunny spot in your garden. Give it well drained soil and now and then water and it will do just fine. 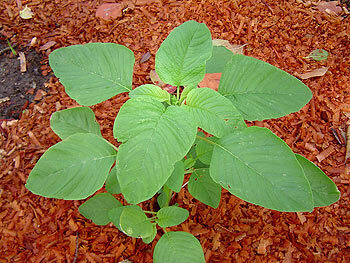 Planting and Growth: This plant will do well planted in semi to deep shade. This is an extremely irritating plant and contact with it should always be avoided. I had my first experience with it in Guatemala and it has made me wear gloves when weeding in that area of the garden. It really is very nasty stuff. Photographed: In Fernz Fernery at the Winter Garden in Auckland, New Zealand, 2013. I remember with great fondness my grandfather arriving on a hot sunny summer afternoon with a big ceramic bowl of his fresh garden strawberries. Mom would make shortcake biscuits, whip some heavy cream and we would indulge ourselves. One can never have enough strawberries and cream. In Taxco we were very lucky to be given strawberry plants from a garden in nearby Landa. The berries are not huge like supermarket strawberries; they are just like the ones my grandfather grew – delicious. Benefits and Drawbacks: According to Montserratian Bernie Callender, “Strawberries have the highest total antioxidant power among major fruits & protect the body from cancer causing, blood vessel clogging free radicals.” Sad to say, strawberries always find themselves on the top ten list of veggies and fruits with pesticide/herbicide/fungicide residues. 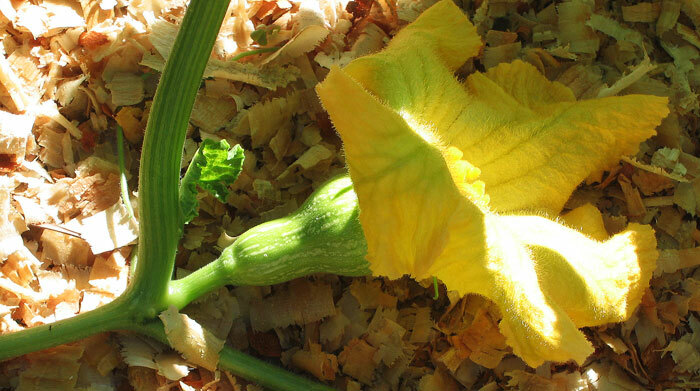 Eat them grown on an organic farm, from your back yard organic garden or not at all. Planting and Care: Strawberries are from temperate America and prefer an acid soil.They like full sun, but will tolerate light shade. For best results the soil should be moist, but well drained. This is a bushy plant that will grow to be 16 feet tall when happily placed. It is tolerant of the cold even to freezing temperatures, but if it gets much below freezing the plant will not survive. Planting and Care: It is tolerant of soil pH and quality, but it does want it to be well drained and to receive regular rainfall or watering. In cooler climates plant it in full sun or in sun and bright shade. In warm climates I would place it in a morning sun only spot in the garden. 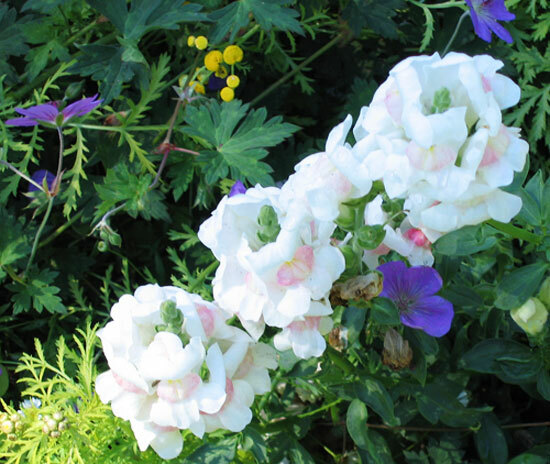 This appealing perennial gives us a selection of flowers from the white pictured to pink and purple. It has flower spikes as tall as two feet though some varieties are shorter. 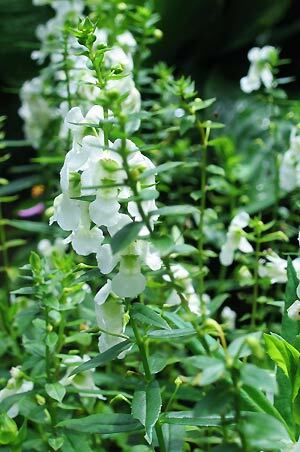 Planting and Care: Find a hot sunny place in the garden where you want blossoms all summer and that's where Angelonia should be planted. Sugar cane produces a staple food for all of us world wide. Just imagine your cup of coffee or your children's Christmas cookies without out sugar. For those of us lucky enough to live in warm or hot climates, sugar cane is not only used to produce sugar, it is eaten fresh and not only by children. From: Hot climate areas of Asia. Planting and Care: Cane likes to grow in the hot sun of hot climates as long as it receives a generous and regular dose of rainfall or watering. In the home garden it is most often grown as a sentimental plant, stalks are harvested for eating fresh and there is no intention to make sugar. **Sun Cactus, Santa Marta, Red Flowering Cereus, Pitaya de Cerro Disocactus × hybridus 'Ackermannii' or Disocactus speciosus (Cav.) Britt&Rose or Disocactus x hybridus 'Dolly Madison' MOVE -- IS THIS A CACTUS OR A SUCCULENT?? We have these plants set in large pots on the pedestals by the entrance to our patio and front door. In the morning looking out from the kitchen we can see the sun shining through the leaves. In late spring here by Lake Atitlan in Guatemala, the sun cactus goes into bloom. 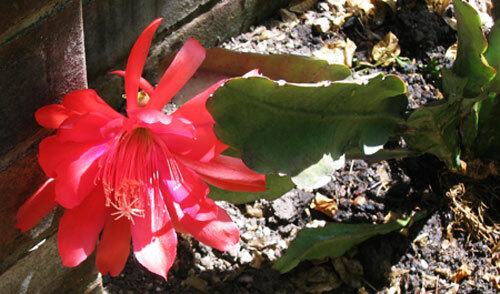 Unlike many flowering cactus of this type, the flowers last two and sometimes three days. The flower is as large as my hand and I have a big hand. 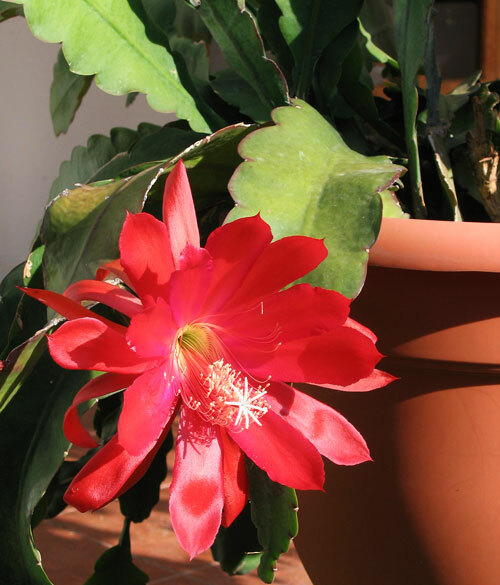 It is beautiful and for its size it is more stunning than the Christmas and Easter Cactus flowers I was used to enjoying as house plants north of the border. We actually have quite a few of these now in the garden and they've been blooming for about 2 months. Planting and Care: I bought this plant in the local market with its stunning flower in full bloom. I planted it in a semi shady area of the garden in and enjoyed the show. 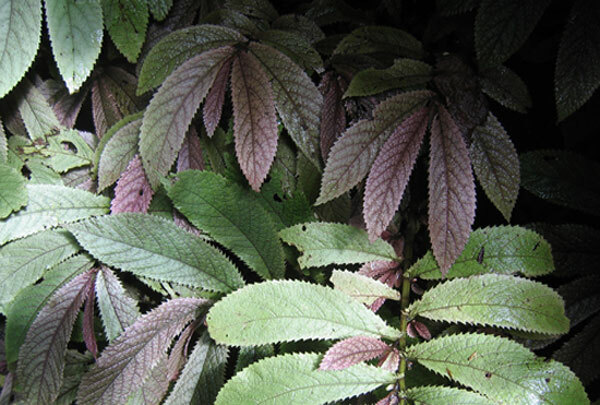 Over time the plant became very distressed with weak softening leaves and a sickly color. I pulled it out of the ground, rinsed it first with a weak solution of clorox and water, then with clean water. I let it dry out for a week or so and then replanted it in a pot with soil I had also cleaned with the clorox water and then let dry out. Everyone looked at me askance, but it worked and the small plant is now large and bursting out of its pot. What could be brighter or more welcoming in the garden than a few blooming sunflowers and the seeds make a great edible treat too. Benefits: This wonderful flower produces great quantities of edible seeds and that's very good because the seeds are believed to be very nutritious. They contain vitamins E and B and minerals potassium and zinc. The vitamin E in sunflower seeds, providing about half your daily E requirement, should help a lot in reducing allergies. And, if all of that is not enough, sunflowers are also attractive to butterflies and hummingbirds. This is a tall plant and will probably need staking of some sort. Planting and Care: Plant this in full sun and hope you have a long hot summer because that's when this plant produces the most flowers. 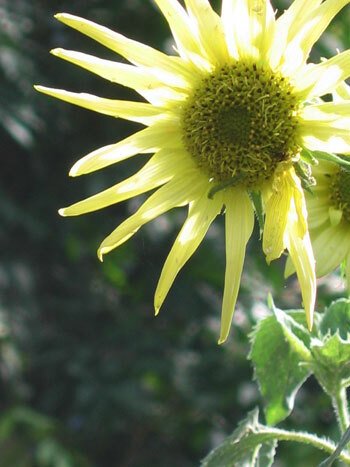 Along with lots of sun, Helianthus debilis likes a moist well drained soil with lots of humus. 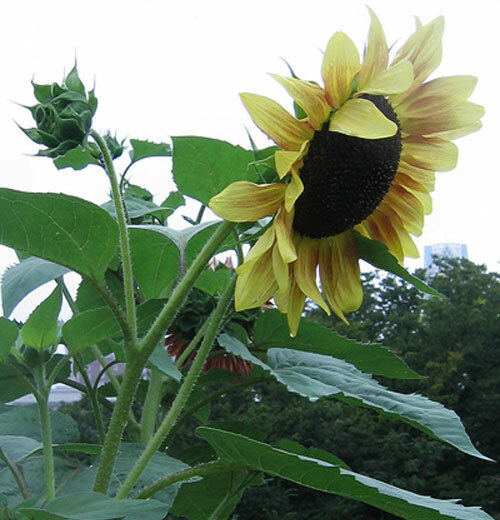 Sunflower 'Strawberry Blond' Helianthus L.
Photographed: In Providence, RI, in 2014. As you can see in the photograph this is a very appealing ground, fence or wall cover. The sparse tiny red flowers are something of a bonus to the attractive foliage. Planting and Care: You may easily grow this hardy little plant in full sun or semi shade. It is attractive the year round and it will hold up well during times of drought. 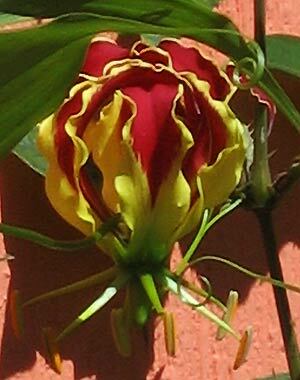 **Superb Lily, Kalihari in India Gloriosa superba L.
This is a trailing plant with brilliant exotic yellow and red flowers or with brilliant yellow and deep red flowers. 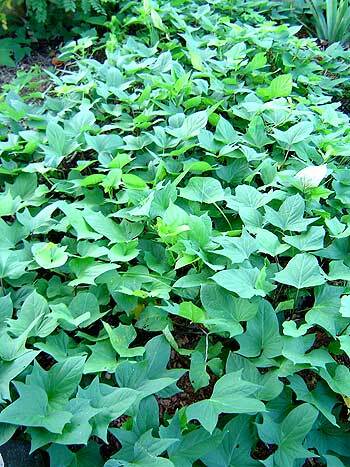 It trails over other plants in sunny areas and can be propagated by seeds or tubers, but most commonly by tubers. Without its wonderful flowers, it might almost be considered a weed since it is so hardy with absolutely no care. We had it just below the our deck at our home in Montserrat. It’s great for cut flowers, though all parts of the plant are toxic. Photographed: On the left in our deck garden at our former home in Montserrat and on the right in the Botanical Garden at the Hotel Atitlan on Lake Atitlan in Guatemala. This is a relatively small tree growing only to about 25 feet. 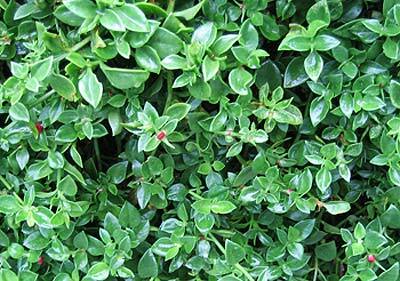 It is tough though and can easily be used as a hedge. 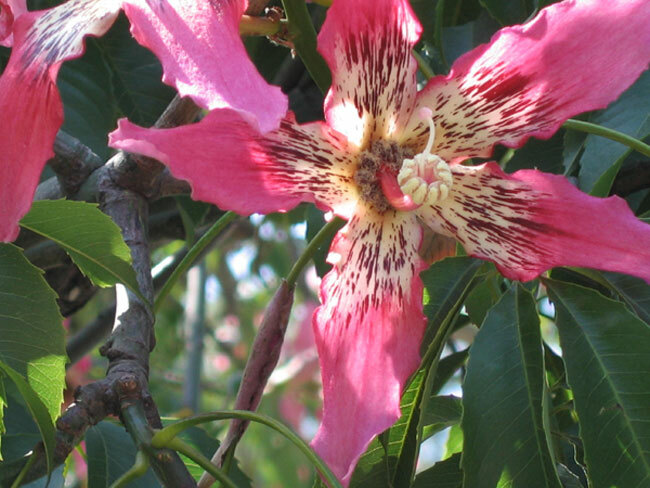 Planting and Care: You may propagate this tree with seeds pretty easily. 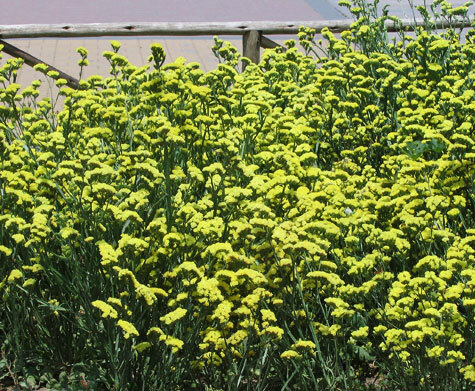 It likes to grow in full sun and once settled in it is quite drought tolerant. Its tiny fruits are delicious and very attractive when still on the tree. This is one of the very popular hanging house plants in the northern United States. 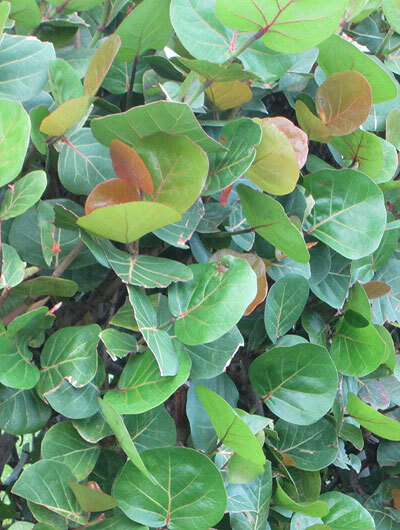 Its leaves are shiny, fleshy and a vibrant green that stay that way the year round. 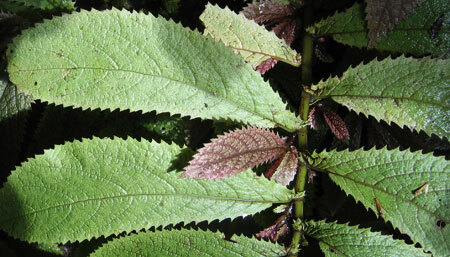 It does produce small flowers, but they are inconsequential to the enjoyment of this foliage plant. 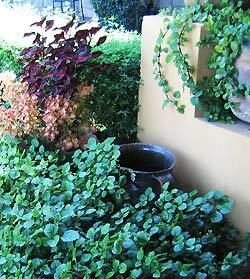 Planting and Care: Swedish ivy is not frost hardy, but will do very well in a semi shady area in a warm climate garden. In a window situation it likes a bit of sun and routine watering. In either place, give it some fertilizer now and again to keep it looking its best. 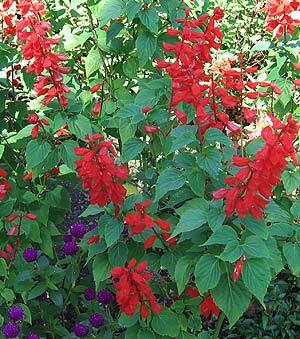 This is an easy to grow annual that will fill in your shady garden with some delicate color. 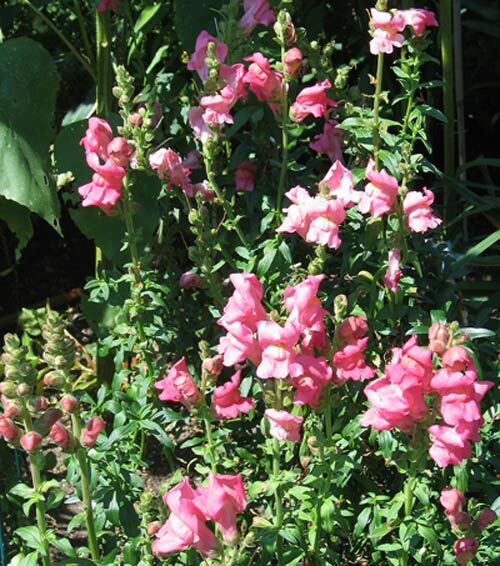 Planting and Care: This is an annual that will grow to be about a foot or a foot and a half high in a shady or semi shady part of your garden. It likes a good fertile soil and regular rainfall or watering. This is a lovely light hearted perennial. From: This is a prairie flower native to the state of Missouri in the US where they grow wild in reasonably moist soils. Planting and Care: Plant in well drained and even heavy soil in full sun or partial shade and it should do just fine. 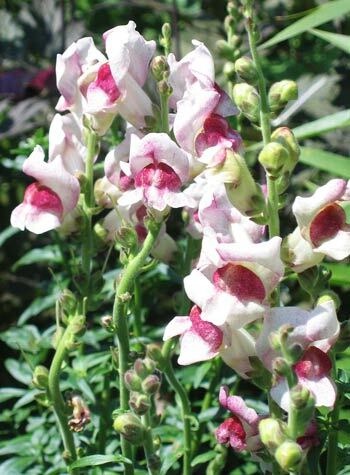 This beautiful and very cheerful perennial will readily climb or spread out in a large bed of glorious flowers. 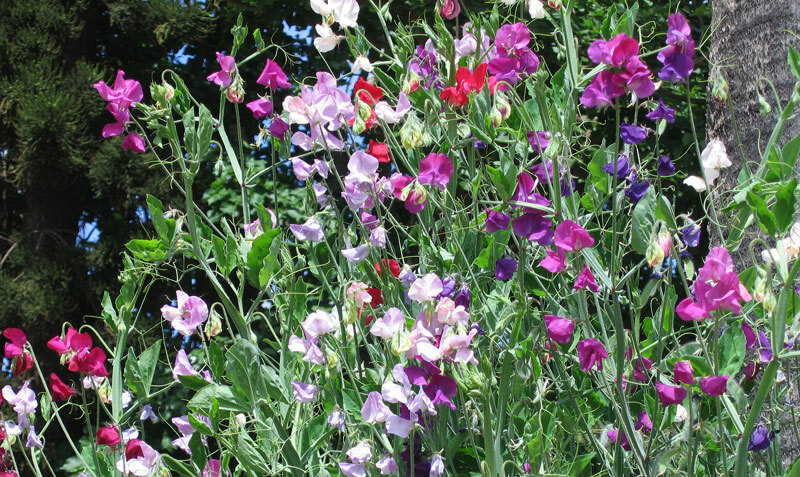 I asked my husband to plant five packages of sweet pea seeds and sadly he misread the distance between seeds for the depth of planting. Four inches was a little much and none survived. I'll get more seeds soon because these truly are delightful plants. From: Sicily and southern Italy and islands in the Aegean Sea. Photographed: At Villa Giulia in Palermo, Sicily, Italy in 2012. Planting and Care: These plants and their flowering stems will spread or climb about five feet. They prefer full sun, but I suspect in tropical climates they will appreciate protection from the hot afternoon sun. The sweet potato is one of the best foods in the world. You can eat it as you would eat a white potato -- baked, boiled, fried or in a million other ways -- but, you can also make it into a sweet treat as the name implies. The plant is vine like, not looking at all like a white potato plant. From one vine you can cut runners that will root in a few days so you can have as many plants as you want or have room for. In Montserrat sweet potatoes are considered desirable enough for folks to have stolen plants from my garden when all they had to do was ask me. Who would have thought such determined Christians would have behaved in that way? Benefits: Along with carrots, sweet potatoes have beta-carotene, a super source of vitamin A which is especially beneficial for your skin. Among other things I've heard that they will reduce your risk of cancer and have an overall extremely beneficial effect on your health. I happen to love sweet potatoes and I have actually noticed a beneficial effect on my skin when I eat them regularly. From: Native to Central and South America. 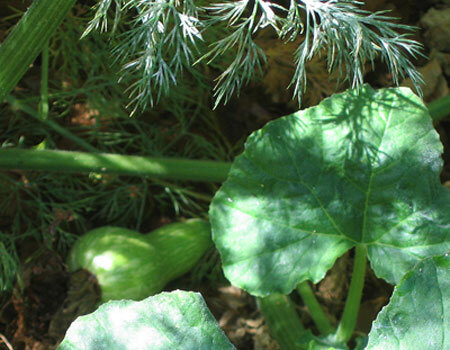 Planting and Growth: Each plant will need a square foot of garden space in which to grow. The soil should be loose and fertile. Place a stem in the center of the square and carry on until all your available squares are planted. Water as you would any new plant for a few days every day, then every other day and so on. Within a week they should be off and running. Once set, they will do fine with the water that arrives by rainfall in most of the tropical Caribbean and unless they are not looking the lovely green (as above) they don't require much fertilizer. Planting them in good well composted dirt should be just the ticket for a good crop which you should be able to harvest three months from the date of planting. Harvesting: Do not water the plants three to four weeks prior to harvest. When you do harvest, dig them up carefully so as not to bruise the skin and then let them dry a few hours on the ground. Our best advice for storage in the Caribbean environment is to cook and then freeze them. They will last about a month in a dry place, but they do seem to lose something which is impossible to describe -- best to cook and freeze. Problems: Thieves! And, you need to create a new bed for every planting of sweet potatoes. So you need to consider rotating these plants throughout your garden area, not returning to the first bed for a few years. Yield: In our second harvest we dug thirty pounds of sweet potatoes from a 10 x 10 foot patch of the garden. It had been fed with laundry water, never having been fertilized or watered in any other way. The potatoes were beautiful, more perfect than any we've seen at supermarkets in the States! 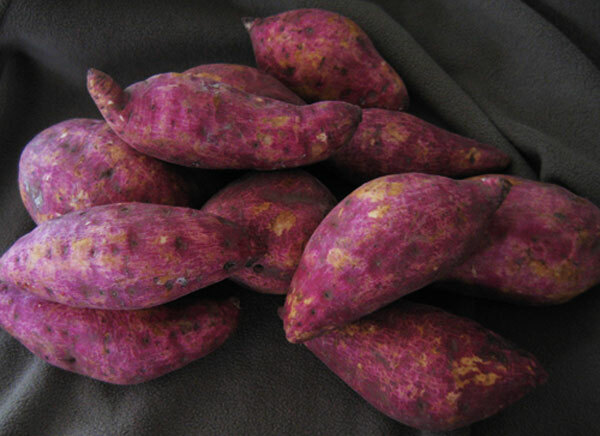 For those of you like us who are living in Latin American or even some Caribbean countries, on the left below is the vine of the local variety of a purple skinned sweet potato. They are delicious and all but identical to orange sweet potatoes you may have known in northern countries like the US or Canada or in most of Europe. You may cook them and prepare your sweet potato recipes identically. The flesh of these purple skinned potatoes is orange, not white as with some Caribbean potatoes that are also purple skinned. For those of you who live in an isolated tropical environment like we did, you know that there is bounty from the garden at specific times of the year and a dearth of available fresh products at other times. And...it is difficult to imagine using a whole stem of bananas or plantains at a single go. So, when you harvest sweet potatoes give them a very good rinse to remove all the dirt possible and let them dry. 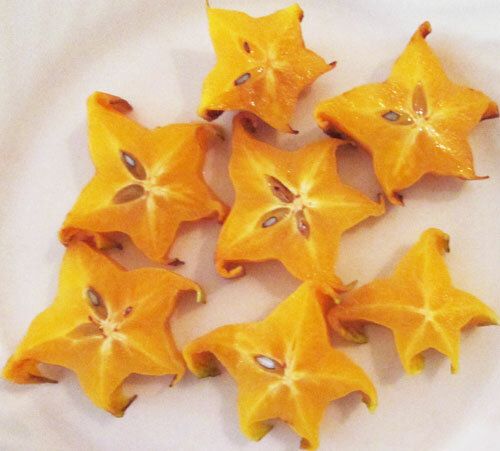 Then peel and cut them into similar size pieces and boil them till they will slide off a fork when pierced. Drain them and put them in a big pan. Add an equivalent quantity of ripe bananas (maybe from the freezer), a bit of butter and mash everything together. If it needs a bit more sweetness add some brown sugar. Freeze them in quantities that will be comfortable to use in two days time. When you think of French fried potatoes, simply substitute sweet potatoes. You may never go back to the Irish variety, except of course for fish & chips. Boil several unpeeled large sweet potatoes until a fork piercing them to the end of the tines easily slides out. Drain and cool the potatoes and peel them. Mash them a bit with a hand masher and then add about 1 cup of freshly squeezed orange juice. With your hand mixer, begin at low speed to break up the potatoes and incorporate the juice. Add more juice as needed to make a thick, smooth and wonderful alternative to the once wonderful now radiated, pesticided, genetically modified white mashed potatoes. I'm Irish by heritage and for me white potatoes were a food group for most of my life. For the most part, I've now moved on to home grown sweet potatoes. This was the first year we tried to grow swiss chard. We planted a row of seeds directly in the garden with no success, not even one see germinated. That being said, we went directly to "Plan B" -- planting in plastic seed starter trays and we had had very good results. Soon the little plants were ready to transplant into the garden which you can see in the photo to the left. In 2009 in Montserrat we had had an ENORMOUS problem with caterpillars, except on the Swiss chard. We think the local insects hadn't figured out that the chard is a desirable food; maybe they thought it was a weed and insects never seem to bother weeds. This philodendron look alike has fooled many folks like me. It is very similar, but in the end it is not a philodendron at all. Planting and Care: This is considered a relatively difficult plant to grow out of its natural environment. It requires warm temperatures, not generally below 60° F., lots of humidity and the rich soil it requires must be kept moist except in the very coolest months of the year. If that wasn't enough, this plant also loves bright light, but no direct sun. 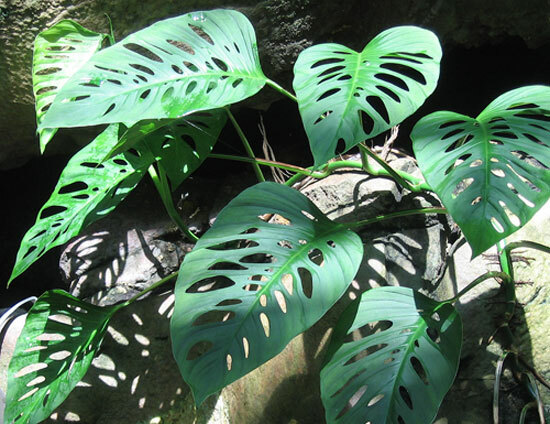 My #2 Mystery mistakenly on the PHILODENDRON PAGE was solved by Ella, a visitor to my site. As it turned out, the plant wasn't a philodendron after all. Ella, many thanks for your help.